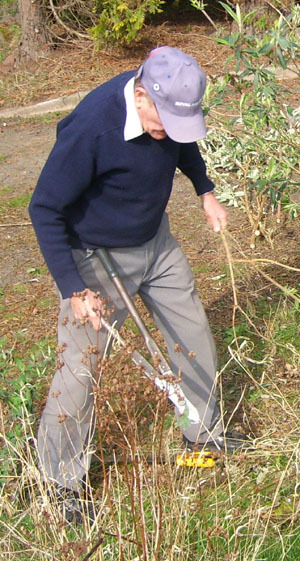 Along with John Plant (see below), former Club Chairman Vin Turner has been granted honorary Life-time membership. 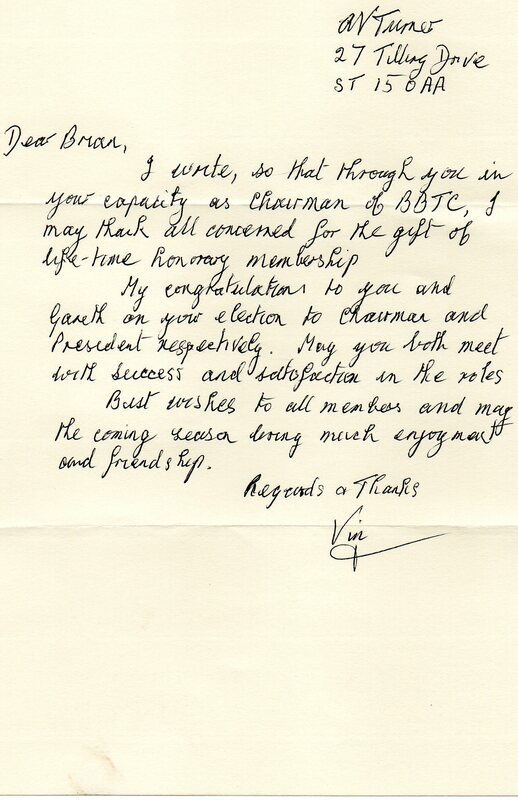 He has been presented with his certificate by current Chairman Brian Astbury, and was kind enough to send us the attached letter of appreciation. 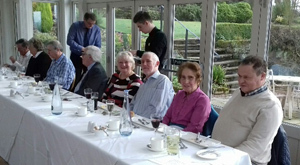 A very enjoyable 2019 Club Lunch took place at Barlaston Golf Club on February 24th. As well as a hearty meal, the opportunity was taken to present a few trophies, and to introduce members to our new Club uniform. 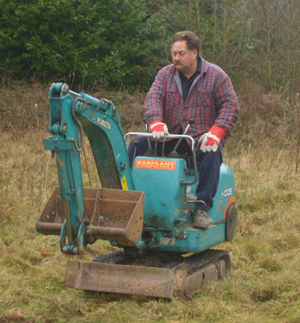 Chris Roberts and his band (Des, Andrew, Steve, Neil, and Alan) gave up performing 60's covers for two days and instead have cleared an enormous amount of brambles from the Green surrounds. 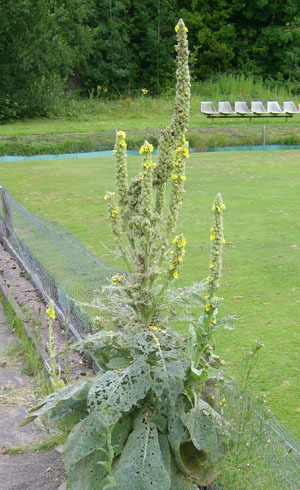 The long-term plan is to seed the area with wild flowers, thus making our Club an even more pleasant place to visit and play. Thanks to all concerned for your efforts. Thanks to the skills of Alan Corbett, our Club name is now proudly displayed for all to see. 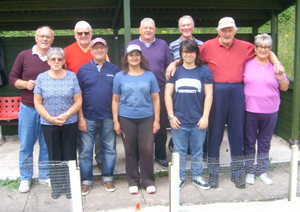 Our annual internal Doubles tournament took place on Friday 28th September in dry, sunny conditions (if slightly cool towards the end!). 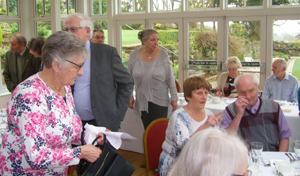 An excellent turnout had a very enjoyable afternoon enhanced by excellent refreshments kindly provided by various Club members. 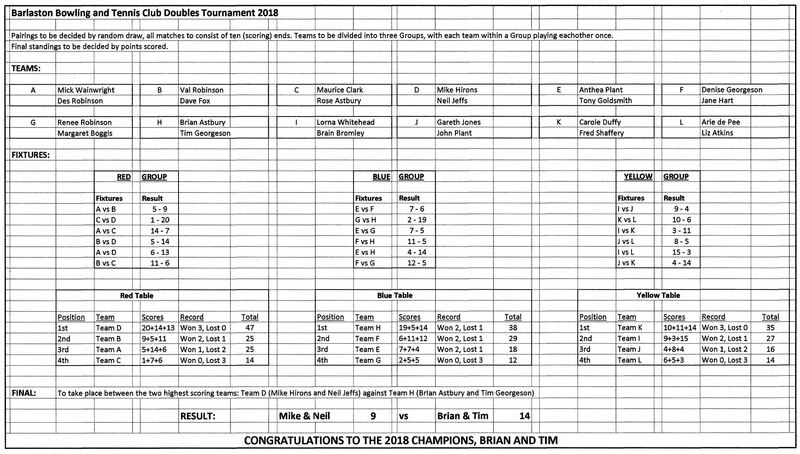 Photos and scoresheet below. 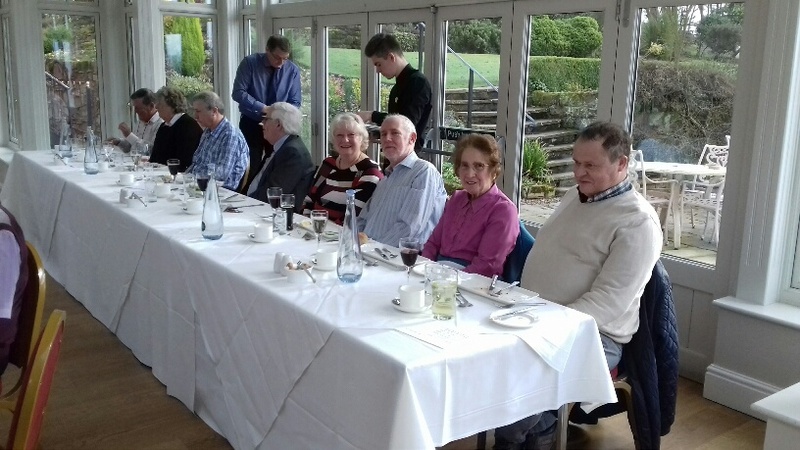 The four finalists were rewarded with a bottle of wine each for their efforts, and the winning pair, Brian Astbury & Tim Georgeson, will be presented with their trophies at a later date. 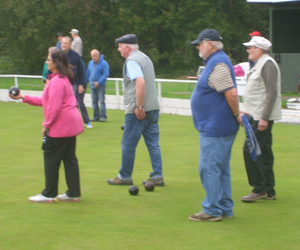 The season has concluded for our Stoke Men's and Staffs Ladies teams, and both have performed admirably. 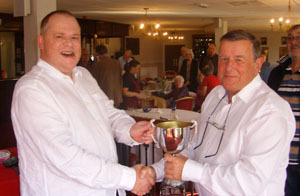 On an individual note, congratulations to Ken Marshall for achieving the highest aggregate, which took him to 4th place in the Division totals. Grandson Kyle couldn't hold on to his aggregate prize, but still achieved the highest average amongst our players. 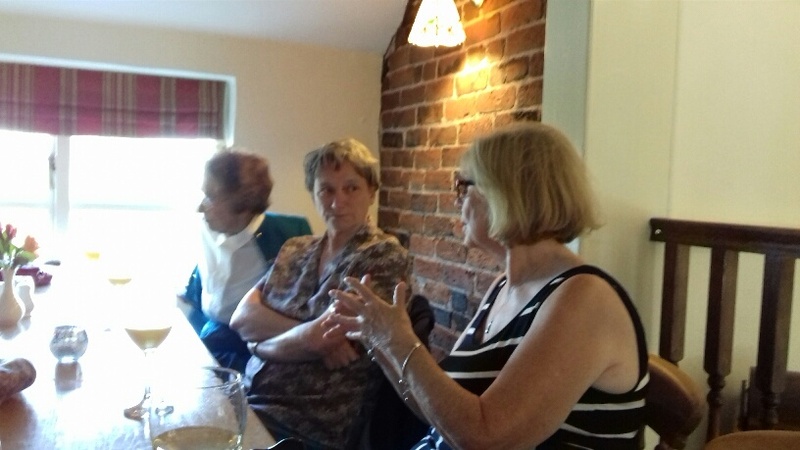 For the Ladies, congratulations to Anthea, Carole, Renee and Rose who finished 11th, 12th, 13th and 14th respectively in the Division averages. 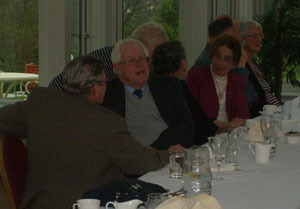 The Club extends its sympathy to former Club stalwart Dave Beech, on the loss of his wife, Sheila. May she rest in peace. 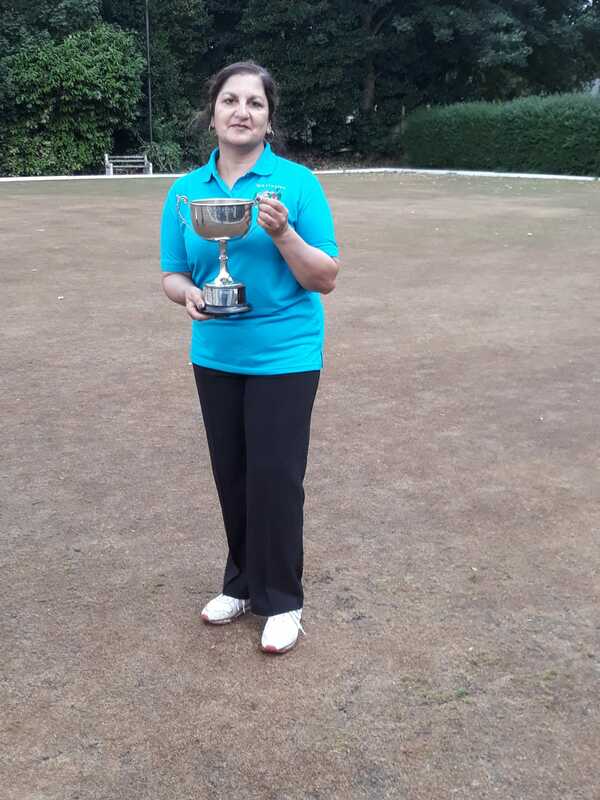 Many congratulations to Rashmi Katbamna, who finished as runner-up in the Staffordshire County Ladies Bowling Association 'Nancy Hackwood Cup' on Sunday 29th July. 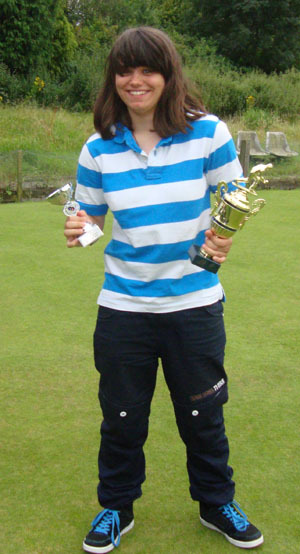 Rashmi is pictured here with her impressive trophy. 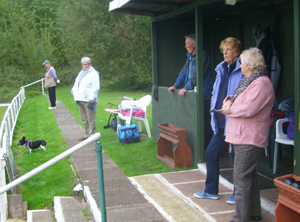 On Saturday 4th August the Club sucessfully hosted a qualifying round in the Saturday Mixed League Triples Competition. 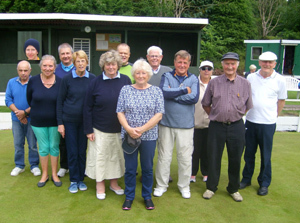 Our Triples team of Brian & Rose Astbury with Carole Duffy unfortunately lost 21-10 to a team from Wolstanton Park in the first round of their qualifying competition staged at New Stoke Park. Congratulations to Emma Dawson, who has passed her degree at Loughborough. Emma is now free to concentrate on the important things in life e.g. Bowling! 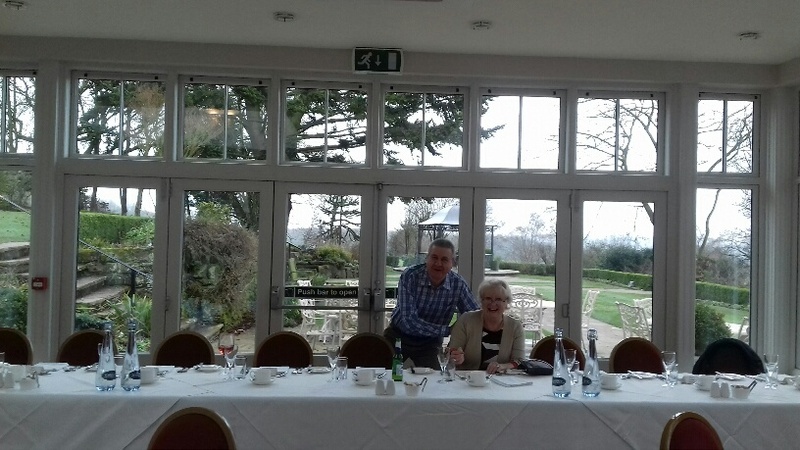 In the Saturday Mixed League Doubles Competition qualifying rounds on Saturday 16th June, Carole and Andrew at Wolstanton Park won their first match against Trent Vale 21-17, but were beaten in the second round 21-12 by the pair from Knypersley. Many thanks to Josh from the host club for scoring. 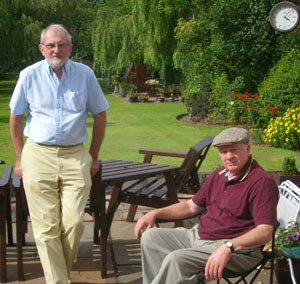 Jan and Ken were unfortunately knocked out 21-14 in their first match against Hem Heath at Hollybush. 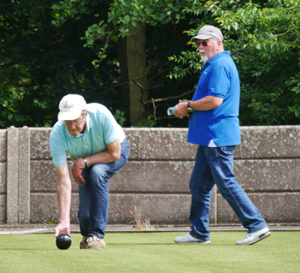 There are plans for a summer social day with internal bowls competition at the Club, which will take place towards the end of the summer. The Club extends its sincere sympathy to Ladies Team Captain Carole Duffy on the loss of her father. May he rest in peace. 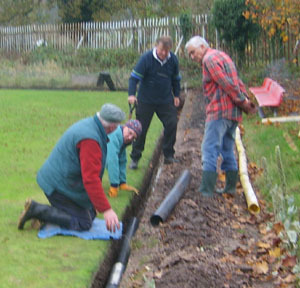 As members will know, the marsh grass has been spreading on the green, and so it was decided to lay a new drainage pipe along the edge of the green in front of the 'North Stand'. 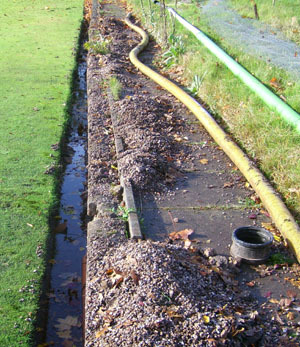 The pipe is connected to the drainage ducts in the rough area to the side of the green, and has been covered in a membrane and then a layer of gravel. 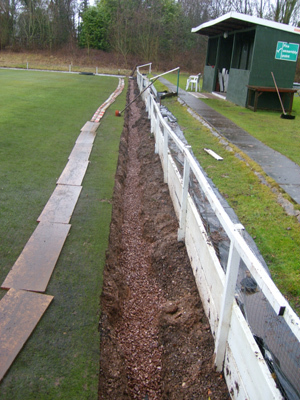 The bowling gully in front of the stand is now wider than it used to be, and the one remaining task is to cover the gravel with a layer of soil, then a membrane, and finally woodchip.Photos of three days of hard, wet and muddy work are below. A huge vote of thanks to the willing (!) 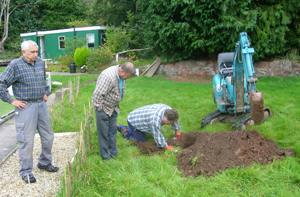 workers (Des, Brian A, Brian B, Alan, Neil and Andrew), and in particular to non-member Chris Roberts (the man with the digger), who went way beyond the call of duty. 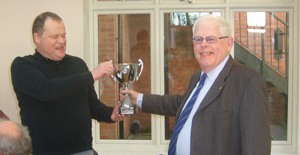 At the 2018 AGM of the Stoke Men's league, our team picked up a cash prize for finishing in 4th place, whilst Kyle Marshall was awarded a trophy for finishing top of the League Division Six Aggregates. Incidentally, Barry Massey has agreed to step in as temporary League Secretary, so the League will be continuing for 2018 at least. 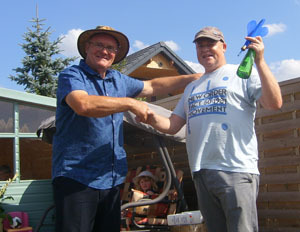 Stoke League Highest average: Kyle Marshall (accepted on his behalf by Neil Jeffs). Ladies League Highest average: Rashmi Katbamna (accepted on her behalf by Val Robinson). Newcastle League Highest average: Rashmi Katbamna (accepted on her behalf by Val Robinson). 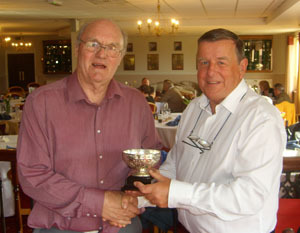 Internal Doubles Tournament winners: Neil Jeffs and Mick Manning. 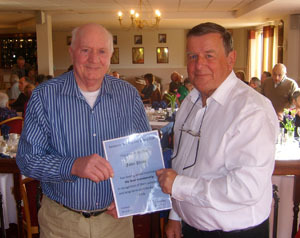 Club Member of the Year: Alan Corbett. 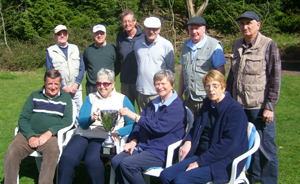 For the second season running, one of our teams has been promoted, and so pride of place goes to the Saturday Mixed ‘A’ team who finished second in Division Two and should be in Division One in 2018. Winning six away games was the key to success, along with consistent scoring – only twice did the team fail to register 140 points in a match. The new ‘B’ team made their debut and finished 9th. With the team consisting of largely new members of the Club, there was no real ‘home advantage’, but that will change next year, and should lead to more than 5 home wins. After their promotion last year, our Newcastle League team found life tough in Division Two, but on a personal level, congratulations to Rashmi who finished high in the League averages. In the Oakhill League, our ‘A’ team did very well to consolidate in mid-table of Division Four following last season’s promotion. If it wasn’t for poor away form (only one win) they could have done even better. Our new ‘B’ team struggled a little and also only picked up one away win but hopefully things will pick up next year. Our Stoke League team were flirting with possible promotion for much of the season, but injury to Carl (who had been having a fantastic season) saw the team fall away to repeat last season’s (more than respectable) finish of 4th.On an individual note Kyle finished top of the League aggregates. 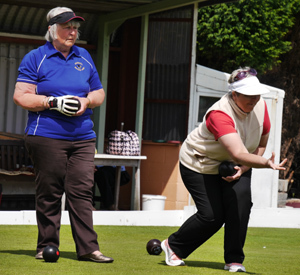 The Ladies team saw a vast improvement on 2016, as they finished comfortably mid-table. 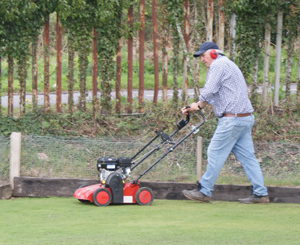 Away from competition, our improved green and surrounds received many favourable comments from visiting players, so it is good to see our investment in the Club bearing fruit. This also enabled us to act as a neutral host green for various tournaments. 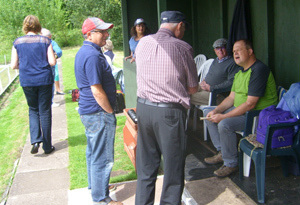 We had also had a successful Open Day and internal Doubles Competition, and continue to attract new members. 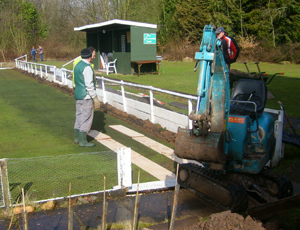 Work has already begun on further ground improvements for 2018 as we continue to progress the Club. 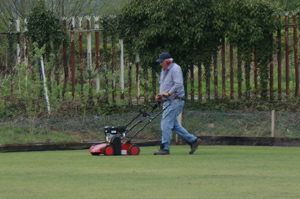 Well done to all Club members for your efforts both on and off the Green. 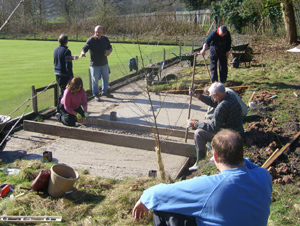 The Doubles Tournament saw the conclusion of competitive bowls for this season, which means groundworks can start! Still concerned with the dampness of the green closest to the main stand, a couple of exploratory holes were dug, without finding any real hopes for an improvement. 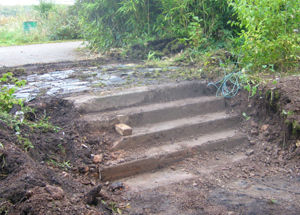 So attention turned to the entrance area, where some old floor tiling and steps have been uncovered which should lead to easier access once they have been tidied up and 'Health and Safety' measures taken. 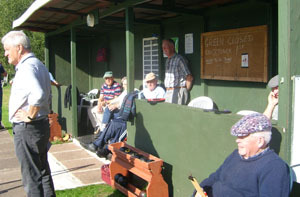 The Club held what may well become an annual internal Doubles Competition on Saturday 7th October. 16 players took part and were drawn out of a hat into 8 teams. 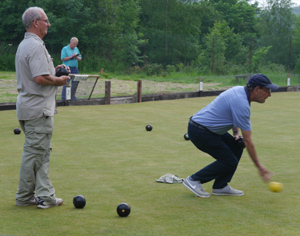 The 8 teams were then divided into two groups whereby each team in each group played each other in a round-robin format in a series of 11 end matches. 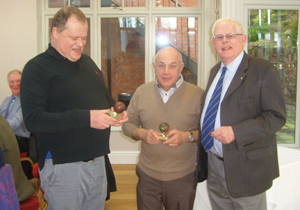 The winners of each group played each other in the Final, which saw Mick Manning and Neil Jeffs defeat Tony Goldsmith and Brian Bromley. 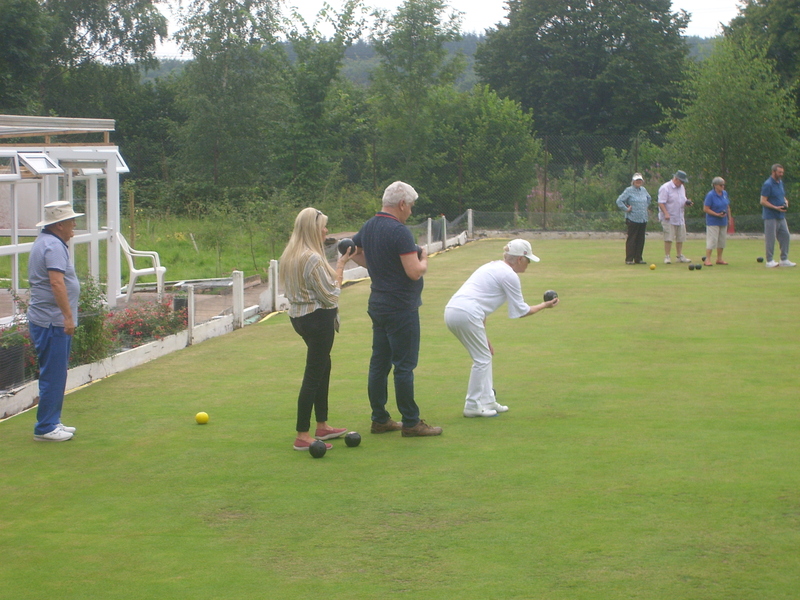 The mid-competition interval was enlivened by a 'nearest bowl to the middle' event which saw Jane Hart win a bottle of wine. Many thanks to Adam (?!) for the organisation. 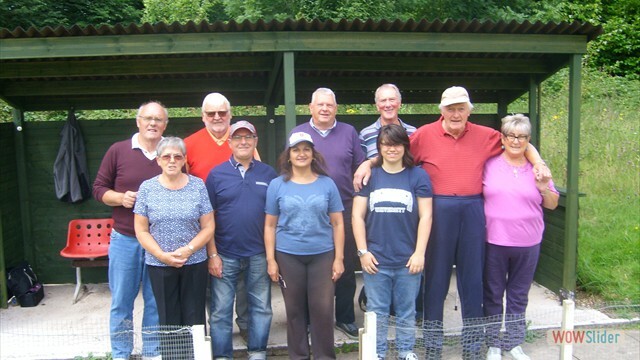 Congratulations to our Saturday Mixed League 'A' team who have finished second in the League, and should therefore be promoted to Division One in 2018. Our team scored 140 in the final match, which wasn't quite enough to guarantee second place, but fortunately New Stoke Park could only manage 171 in their final match. Our new Oakhill 'B' team finished 9th in their inaugural season - room for improvement! Following their promotion to Division Four last season, our Oakhill 'A' team did very well to consolidate in a comfortable mid-table 6th place. 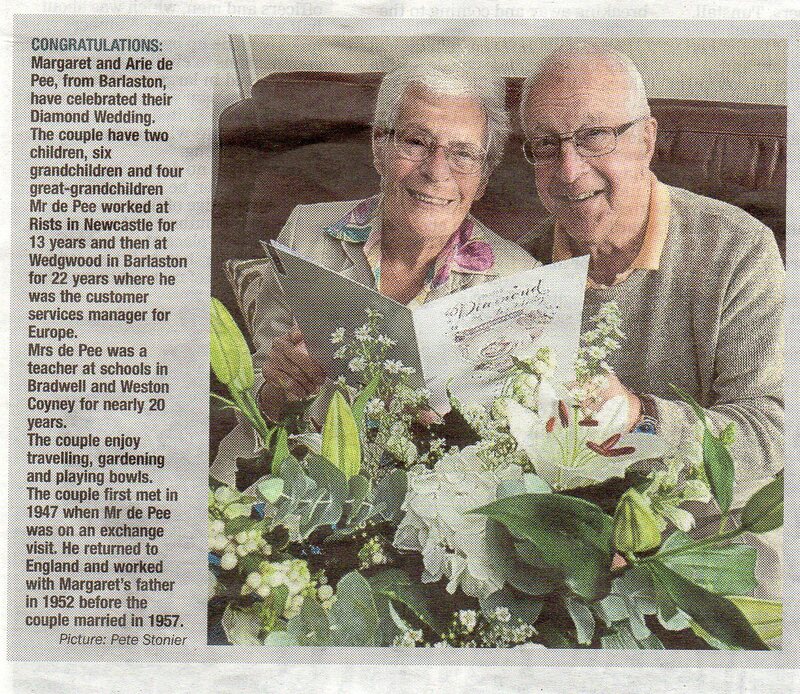 Club stalwart and former Treasurer Arie de Pee and his wife Margaret recently celebrated 60 happy years of married life. This marvellous achievement was recorded for posterity in The Sentinel, as can be seen here. 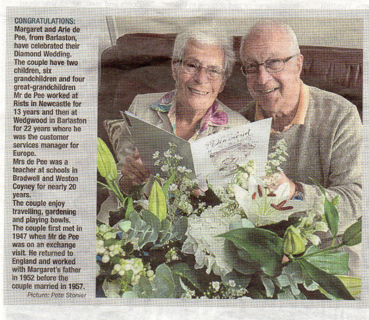 Congratulations Arie and Margaret! 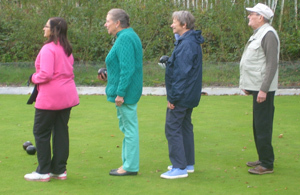 The final Ladies League Table has been published and our team has finished in a very creditable 5th position, representing a vast improvement on 2016 - well done Ladies! The published individual averages for the Division is a mystery, as it seems Rashmi ought to be about 7th, but for some reason she doesn't appear! A qualified Coach is available to run informal coaching sessions at the Club on Sunday afternoons until the end of the season. Anyone who feels they need a little help (probably all of us!) please ring 07954 161907 to find out more details. 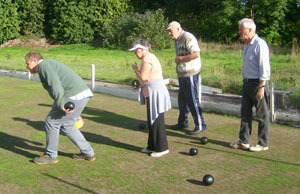 The Newcastle League run a 'Champion of Champions' Competition each season. Our entrant this year was Rashmi, who was extremely unfortunate to be drawn against the eventual winner in the first round. Rashmi scored a very praiseworthy 15 against him, and, as mentioned below, has represented the Club excellently this season in this League. The final league Table for the Stoke League saw our team repeat last year's performance to finish 4th. 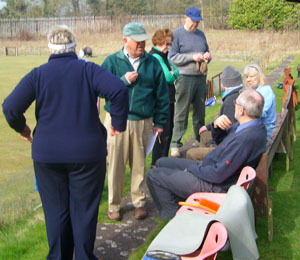 A lowest score of the season in the final match saw the chance to finish 3rd go to waste. 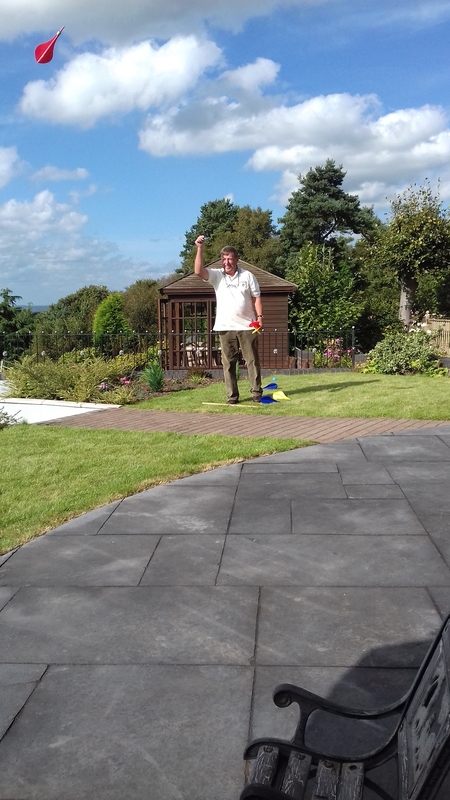 On an individual note many congratulations to Kyle who finished TOP of the League Aggregates (Mick Wainwright was also 14th), and Kyle was also in the top ten of the averages. 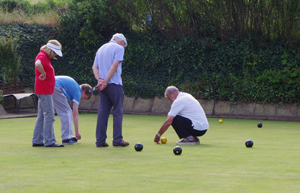 The final league Table for the Newcastle League has been published. Following last season's excellent promotion, our team found life somewhat tougher in Division two and finished 7th. On an individual note however, congratulations to Rashmi who finished 8th in the League averages. 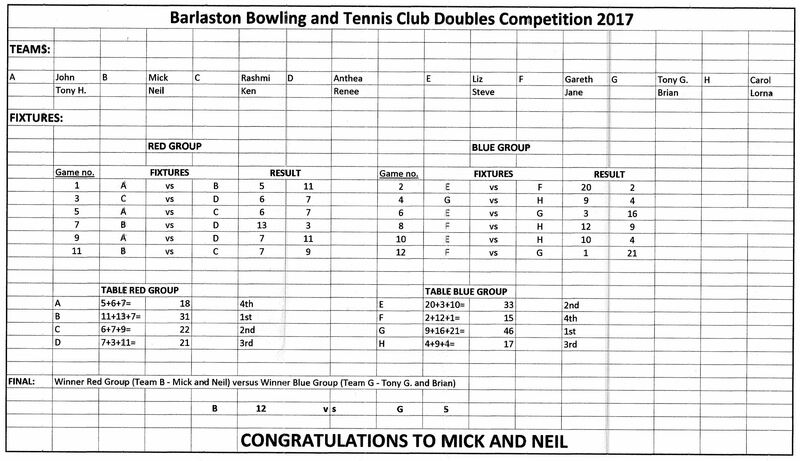 The rain stayed away, and after 8 of the 9 matches, the 'A' team held a narrow 2 point lead, and in the final doubles match, the Club Chairman and Secretary pulled rank to ensure an overall 5 point victory for the 'A' team. 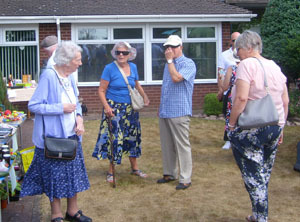 The match provided the excuse for the Club to hold an Open Day, which attracted four newcomers, who hopefully liked what they saw and will be back for more. 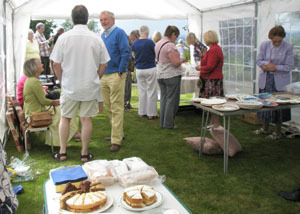 Everybody contributed to the excellent refreshments which rounded off the day, and over £55 was raised for the Club. Photos from a most enjoyable day are below. In the Newcastle League our team is finding the higher Division a bit of a struggle, but on an individual level, Rashmi is 5th in the Division averages. In the Oakhill League, our 'A' team are solidly mid-table in Division 4, whilst the new 'B' team are still finding their feet in Division 5, but hopefully will push towards mid-table in the second half of the season. 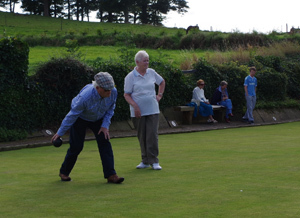 On Saturdays our two teams are both in the same Division, and, as the description would suggest, the 'A' team are doing slightly better than the 'B' team, although both teams are performing well, with two vital away wins each. 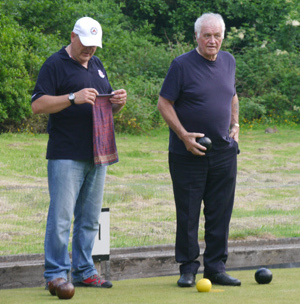 The Stoke Men's Team are second in Division 6, by virtue of scoring very well in every match, even when defeated. A top three finish is very much on the cards. On the individual front, both Kyle and Carl are in the top four of the Division averages.Finally, after struggling for the last couple of seasons, I'm delighted to observe that the Ladies Team are recording much better results this season, and sit comfortably mid-table. Once again, on the individual front, Rashmi is riding high, being 4th in the Division averages. 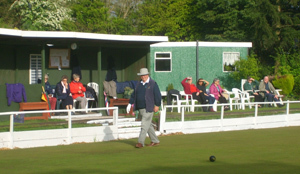 In other matters, our improved green has received much praise, both from opposition teams, and, as a neutral venue for various competitions. 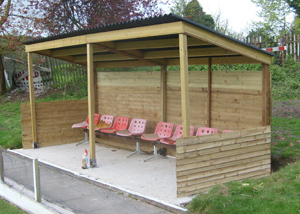 The new stand (built almost single-handedly by Alan) has proved to be a very welcome addition to our facilities. 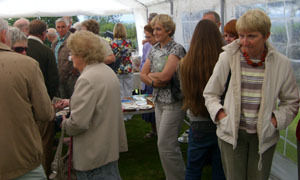 We continue to attract new members, and hopefully our forthcoming Open Day will bring even more. All in all, much to look forward to for the rest of the season. 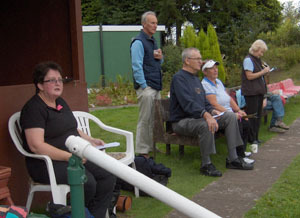 Whilst our Club hosted some qualifying matches in the Saturday Mixed League Doubles Competition, we had two teams competing on other greens. Sadly neither Rashmi & Steve, or Jan & Kyle progressed to the next stage, but better luck next year. 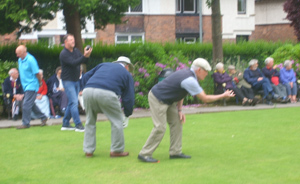 Unfortunately Des and Dave's appearance in the Stone Festival Bowls Finals day was somewhat brief, but here's some photos to prove that at least they got that far! 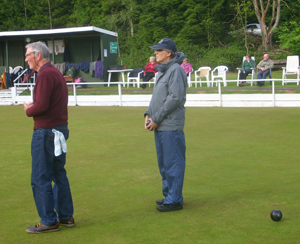 The Club hosted a preliminary round for the Stone Festival Bowls Doubles Knockout Competition on Friday 12th May at 6.00pm. 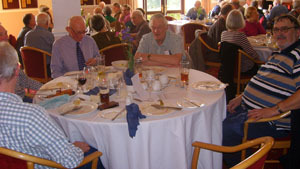 Despite changeable weather, the evening proved to be a success, with our improved green coming in for much praise. 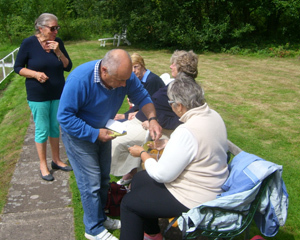 Particular thanks to Val and Rashmi for their help with refreshments, and to Steve for measuring. 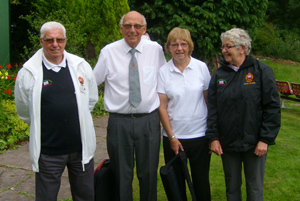 Congratulations on the green to Brian Bromley and his team mate Hilary who progressed through to the next round. The Club extends its sincere sympathy to youngest member Emma Dawson on the loss of her grandmother, Rita. May she rest in peace. A slight case of dyslexia, as our new stand asked for a "short back and sides", but instead received a short sides and back! Seriously though, it's a work in progress and not far off completion now. 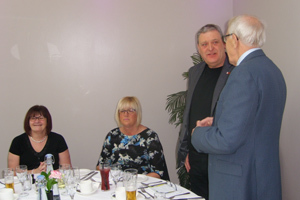 Congratulations to Stoke Men's Team Captain Neil Jeffs, who celebrated a milestone birthday on Friday 14th April. Which milestone? - suffice to say he will qualify for the Oakhill Jubilee League in exactly ten years time. 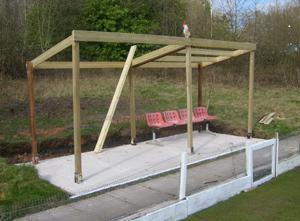 The roof has gone on the new stand - at the moment it's keeping the sun off, but no doubt that will soon change to rain! As mentioned previously, Kyle Marshall finished as runner-up in the Newcastle League Division Three Champions of Champions 2016 Tournament, held at Wolstanton Park. 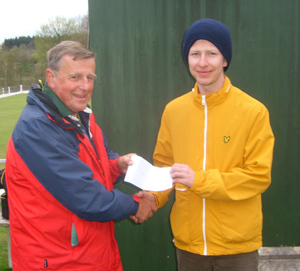 Kyle was presented with his prize for this achievement by Team Captain, Brian Astbury. 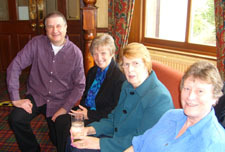 The photo was taken on the occasion of the internal practice match between our Stoke Men's and Newcastle Teams. 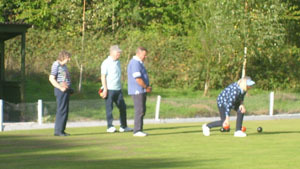 There were many very close games and the overall result saw a narrow victory for the Stoke Team. 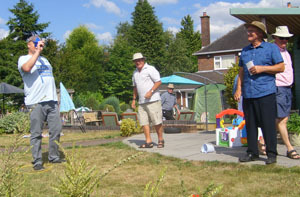 Most importantly everybody got in some semi-serious practice before the imminent start of the League season.Rumours of the improvements to our Green and surrounds even brought a surprise visit from former Club Members the Beech boys, who gave us a quick rendition of "Good Vibrations"...oh sorry, not those Beech boys!! As most of you will be aware, our team in the Oakhill League in 2016 finished second in Division Five. 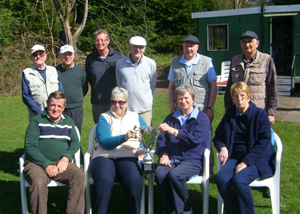 Members of the squad are pictured here with their magnificent trophy. The photo was taken prior to the practice match between our 2017 Oakhill 'A' and 'B' teams, which resulted in a narrow victory for the 'B' team. 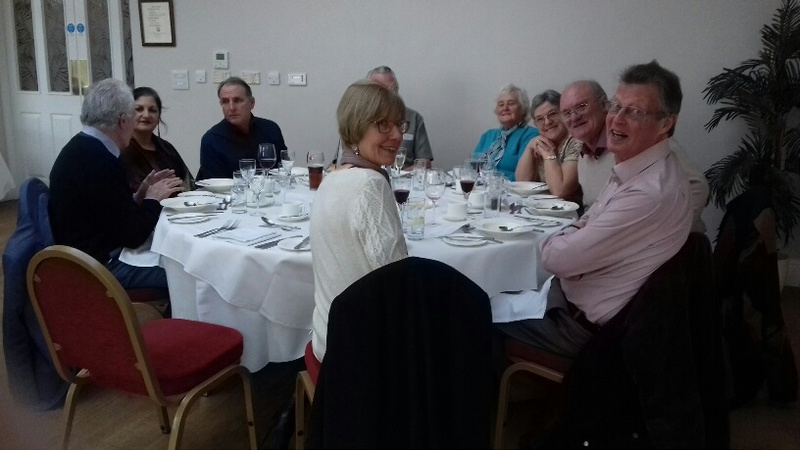 Unfortunately, a vital member of the Squad, Club Chairman Gareth, was unable to be present for the photo, or maybe he just wanted a separate picture of his own! Well done everyone involved! 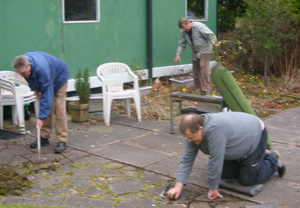 Despite the drizzle, an enthusiastic team of volunteers did a splendid job on the Club Clear-up day on 1st April. 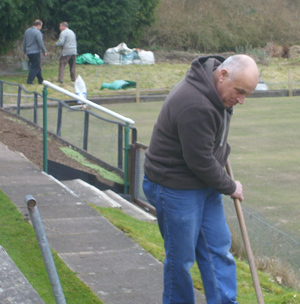 Thanks to your efforts the ground is looking spick and span and all ready for the new season. 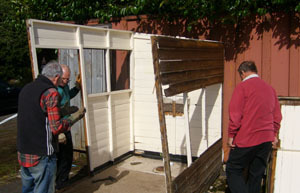 Work has begun on the new Stand - book now to reserve your Season Tickets!! 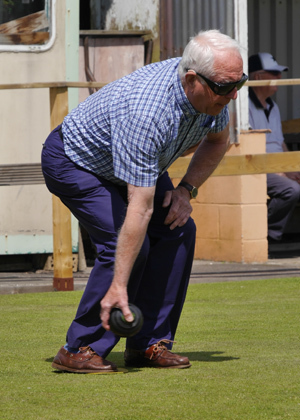 The Club extends its sincere sympathy to the family and friends of Raymond Stowe, an occasional Friday afternoon social bowler, who sadly passed away recently. Rest in Peace, Raymond. 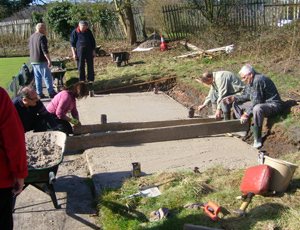 A hive of activity on Wednesday March 15th, as the concrete was delivered which will form the base of the new Stand. 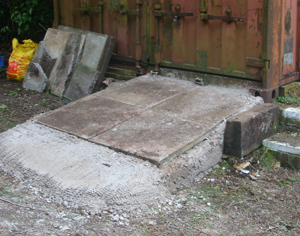 The surplus concrete was used to firm-up the area in front of the existing Stand, and to build a ramp to the Tool Shed. 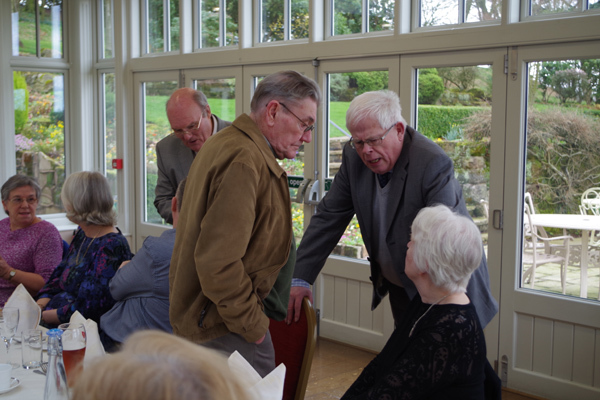 Huge thanks to Chief Organiser Alan, and his willing team of helpers, Brian, John, Neil, Des, Steve, Andrew, and Rashmi, and not forgetting Val who did the vital job of keeping the tea and coffee flowing. 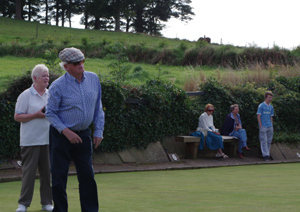 Despite the fact that the missing results have still to be published, it was declared at the Newcastle League AGM that our team had finished runners-up in Division Three, and will be promoted to Division Two for 2017. 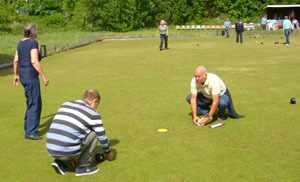 This earned a prize of £30, and there was also confirmation of individual success, as Kyle Marshall finished as runner-up in the Division Three Champions of Champions Tournament, held at Wolstanton Park. At the AGM of the Saturday Mixed League, we were advised that we will be unable to enter a second team in the League for 2017. With Neil Jeffs taking over as Captain of the Stoke Men's Team, it has been decided to ease Neil's workload by having Des Robinson as Captain of the Saturday team for 2017. 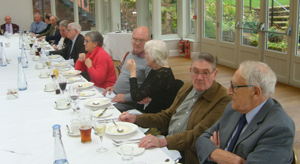 An excellent annual Club Lunch was enjoyed by 40 members and their partners at The Upper House in Barlaston. 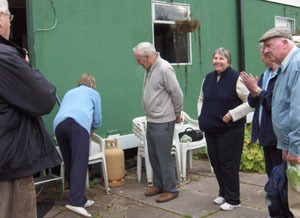 As mentioned by Club Chairman Gareth, we were well looked after by Phil and his staff, and Gareth also took the opportunity to thank Secretary Renee for organising the event, and to comment on the growing numbers and improving facilities at the Club, which hopefully reflect the friendly nature of our Club. 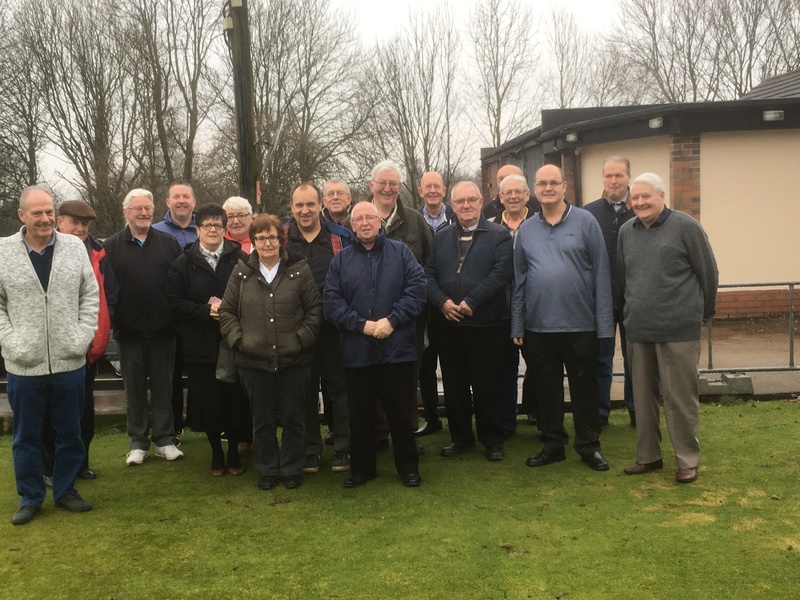 At the 2017 AGM of the Stoke On Trent & District Bowling League, the Club was presented with a prize of £35 for finishing 4th in Division Six of the Men's League in 2016. 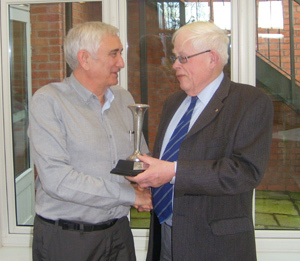 Congratulations to Skipper Keith Hughes and the team! 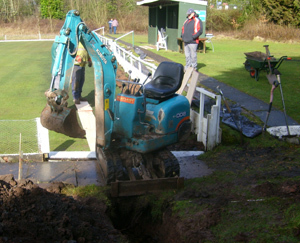 Friday 2nd December was a hive of activity at the Club, as we brought in a mini-digger to dig out the foundations for the new Stand. 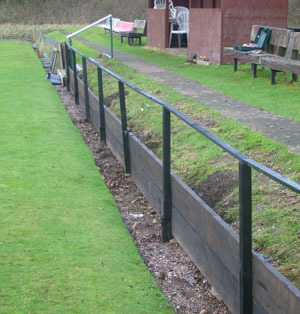 Some of the removed earth/clinker was used to build up the bank behind the new backing boards in front of the home seating. 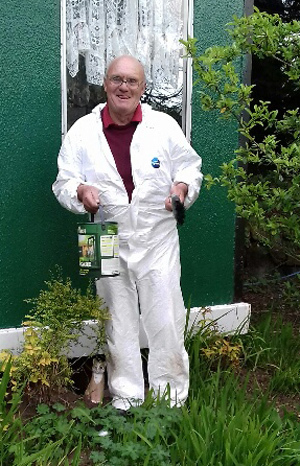 At the same time Steve continued his excellent work painting the backing boards, and Des did more work on the Green. We are ahead of schedule, and with any luck will have a green and surrounds to be really proud of for the 2017 season. 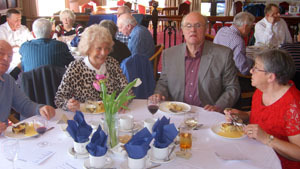 The Club extends its sincere sympathy to Ian Goodman on the loss of his mother, Beryl. 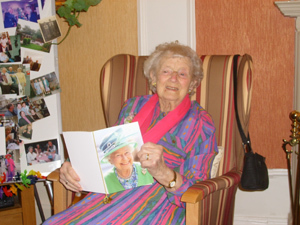 Beryl was a resident of Heyfields, and is seen here celebrating her 100th birthday earlier this year. 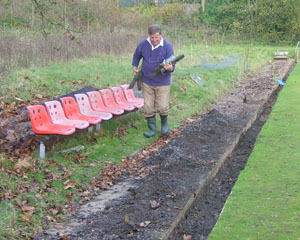 The new backboards in front of the 'home' seating are now fixed in place - next job is to build up the bank behind them. 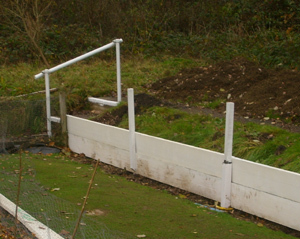 John Plant has constructed a new handrail for the corner that will be in much more use once the new stand is built. 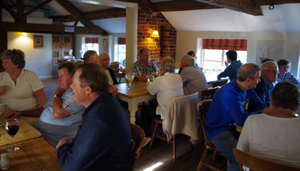 Many thanks to those who attended the 2016 AGM (over 20) - the Minutes are on the Membership page. The changes affecting the Contacts page will appear in the New Year once all aspects have been ratified. 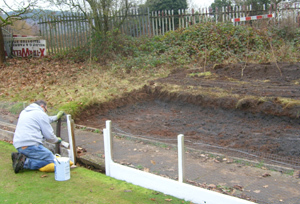 Work continues on the green - it's beginning to look "all white"! The Club extends its sincere sympathy to Carl Williams on the loss of his father-in-law Jim, who passed away on October 25th. 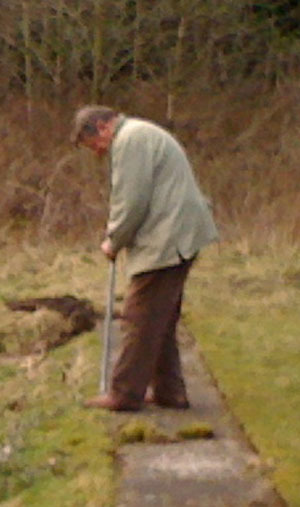 Jim was a staunch supporter of Carl and the Stoke Men's League team, and his stentorian cry of "cracking wood!" will live long in the memory. RIP Jim. 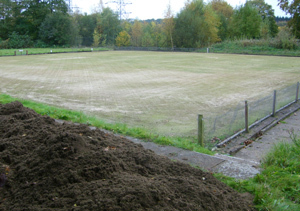 Groundworks to the green have taken place on October 27th, so the green is now out of use until next year. 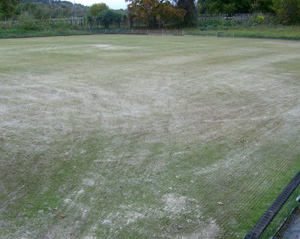 The green has been scarified, seeded, fertilised, and had top-dressing applied. We've had a lot of praise this season for the improvement to the green, and this work should ensure further improvement for next year. 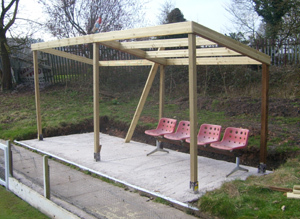 You may have noticed as you drive past that a car has crashed into the perimeter fence; this has been boarded-up, and the matter has been brought to the attention of St Modwen. 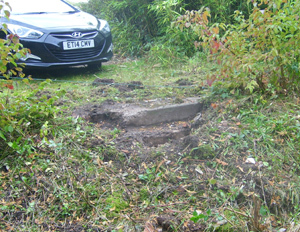 It is hoped that now work is starting in earnest on the St Modwen site that security will be improved, as we have had yet another break-in recently, although fortunately it seems nothing was taken this time. 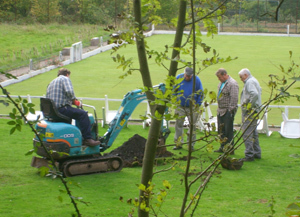 In his letter to St Modwen our Chairman has also raised the question of the dead trees near the Clubhouse which need to be felled, as well as seeking assurances as to St Modwen's continued commitment to the Bowls Club, which may assist us in obtaining any grants towards improving facilities. 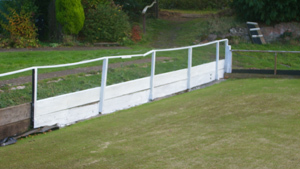 In the meantime, new scaffolding boards have been purchased, creosoted and painted ready for forming the green surrounds. It is hoped that as many of you as possible will attend the AGM - it's YOUR Club and your input is vital. This is a chance to air any grievances you may have, and/or make any suggestions that you may think will improve the Club on or off the green. All contributions would be most welcome. Work has started on reconstructing the edge of the green in front of the 'home team' seating, but the green is still in use, so why not take advantage of these last days of summer. 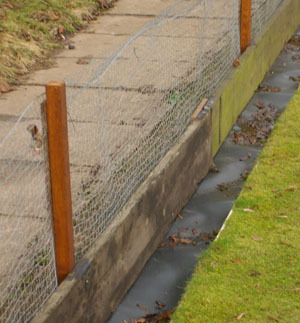 Be warned however - there's now nothing to stop a few rabbits joining you! 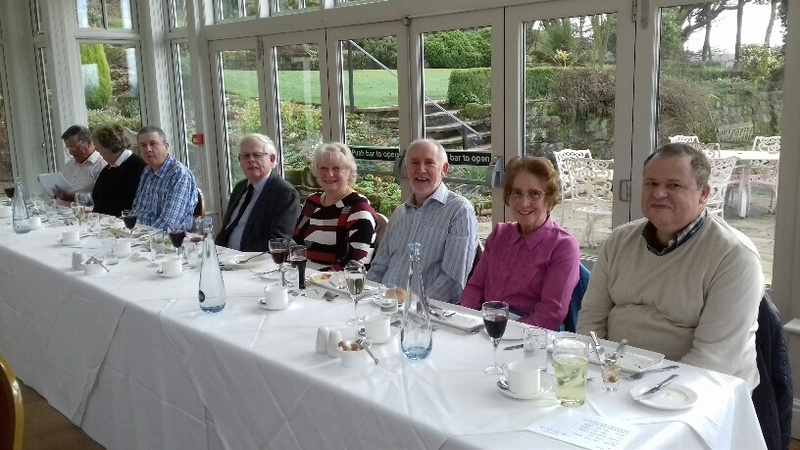 Well done to the Saturday Mixed Team , who finished 5th in 2016, missing out on 4th place by only ten points. This is a great improvement on last year, so well done to everyone involved. Our team in the Oakhill league have finished second, and therefore, all things being equal, should be promoted for next season. CONGRATULATIONS!!! 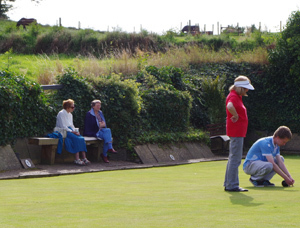 The final table for the Ladies league has been published, with our ladies finishing 10th. A difficult season , but the green shoots of recovery are there, and hopefully things will improve for next season. At last!!! 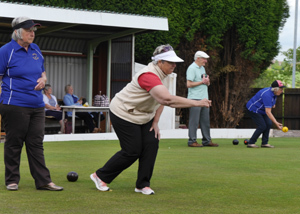 It took all season, but the Ladies finally managed to win a game - their last match of the season. Well done to the ladies for keeping up their morale under such trying circumstances, and it is worth noting that despite all those defeats, they scored consistently and therefore will not finish bottom of the League. 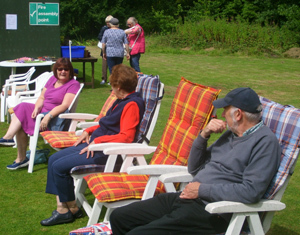 Plans for an open-top bus tour through Barlaston on Saturday, culminating at the village Show/Fete, had to be cancelled due to the inclement weather! 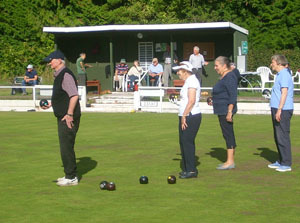 Look out for an article on our Club training day on page 33 of the September edition of The Stone & Eccleshall Gazette. 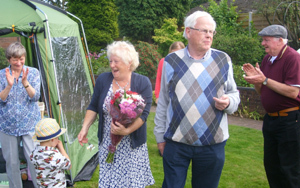 The Club wishes to extend its sincere sympathies to Dave Jones on the sad loss of his wife - may she rest in peace. 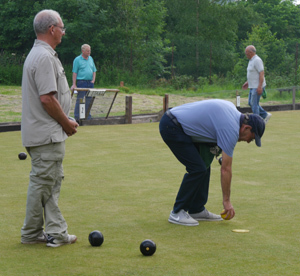 The final league table for the Stoke men's league has been published, and we have finished in a very creditable 4th place - a great improvement on last season, and only 36 points away from finishing second! Well done to skipper Keith Hughes and the team. Well done to Mick Manning, whose efforts in running a weekly raffle this season have raised over £120 for the Club - many thanks Mick! 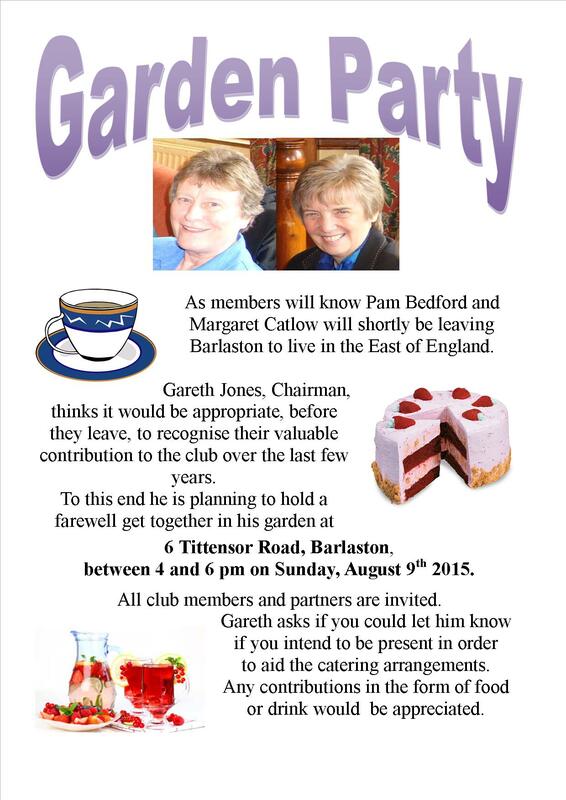 Garden party poster: (Carole would welcome any contributions towards stalls). Ever since the redevelopment of the St Modwen site has been announced we have received verbal assurances that our Club/green would be protected. 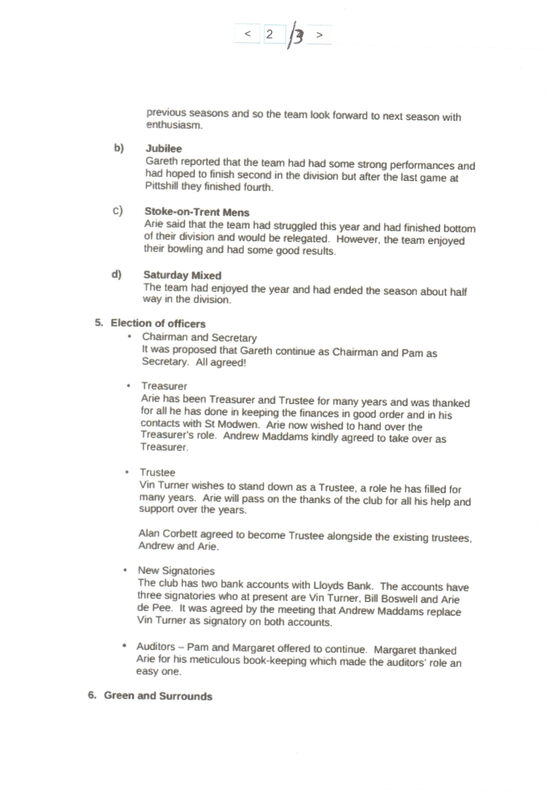 The Club is now delighted to advise that these assurances have been put in writing. Following on from this, the Club continues to be in liaison with St Modwen with a view to re-establishing water and electricity supplies. 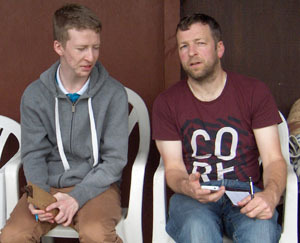 General opinion was that the Coaching Day was a huge success. 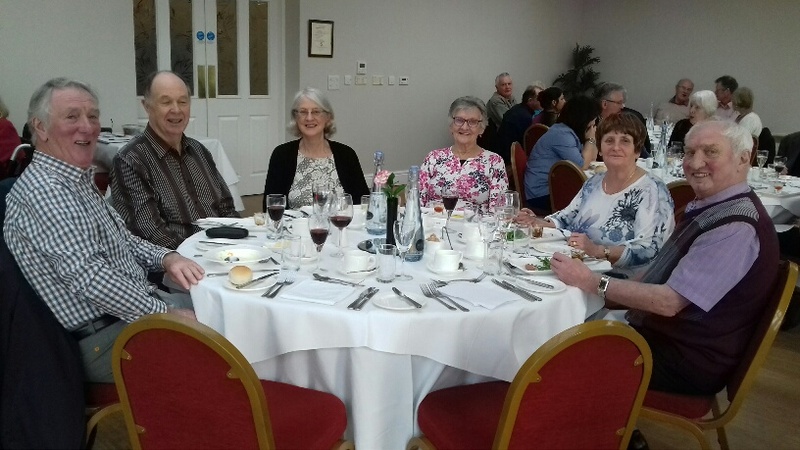 Many thanks to Carole Duffy for getting in touch with National Coach Alan Tizard and arranging it all, and to Carole and her team of ladies for providing excellent refreshments which sustained participants throughout a long but rewarding day. Nothwithstanding all the excellent personal advice and tips from Alan and his four colleagues, perhaps the most useful and educational part of the day was seeing yourself on video - not always a pretty sight but very interesting! (Thanks to Brian for setting up the generator). It was also very pleasing to hear the Coaches say that we were one of the friendliest Clubs they had visited. Was it pure coincidence that on the next day the Saturday team won all their matches?! 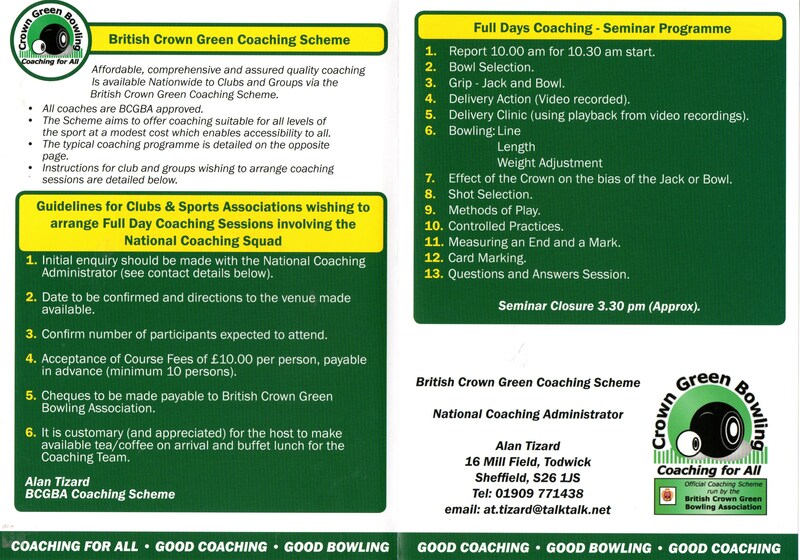 Next Friday (29th July) the Club will be holding a Training Day, hosted by National Coach Alan Tizard. 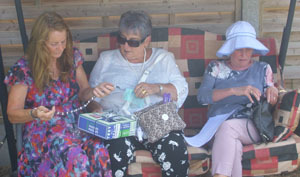 Cost will be £10 per head, and refreshments will be provided. 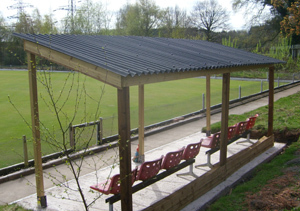 The session will run from 10.00 until about 3.30, so there will be no social bowling that day until after that time. Anyone who wants to take part, and who hasn't already contacted Carole Duffy, please let her know as soon as possible. Tradition has dictated that this review starts with the Ladies team, partly because it’s the gentlemanly thing to do, but mainly because they’ve been our most successful team. Unfortunately this year has been more of a struggle. 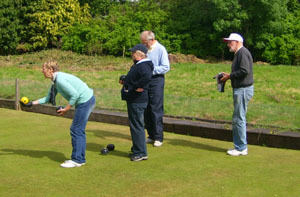 The team is recruiting from a very small pool of players, two of whom are not only new to the team, but new to the game of bowls. The majority of their remaining games are at home, so, in the immortal words of D:ream, ‘Things can only get better’! 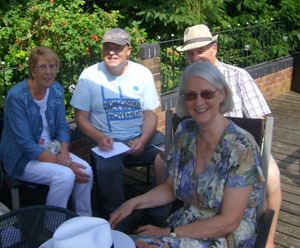 The Oakhill team are, as usual, going well (3rd at the time of writing). It has often been stated in these reviews that more away wins are needed, and the Oakhill team have three so far, which is much to their credit. The Saturday team’s good performances are perhaps not reflected in their League position. Undefeated at home, and with two away wins, the season has been blighted by a disastrous weekend when a rearranged fixture on a Friday night, and the next day’s normal game, saw two heavy away defeats. 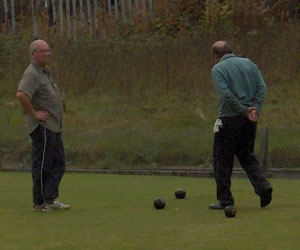 The Stoke men’s team are another whose performances are not reflected in their League position. Although most of their remaining games are at home, their away record has actually been better so far, with two away wins, so it will be interesting to see how the season pans out. 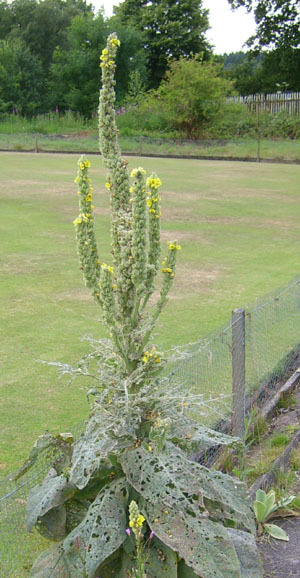 The big success story of the year has been our debut in the Newcastle League. Performing equally well at home and away, the team are currently second and in with a real chance of promotion. On a general note, we have managed to recruit several new players, and whilst more are always welcome, we have to strike a balance which ensures that as many players as possible are able to get a regular game. 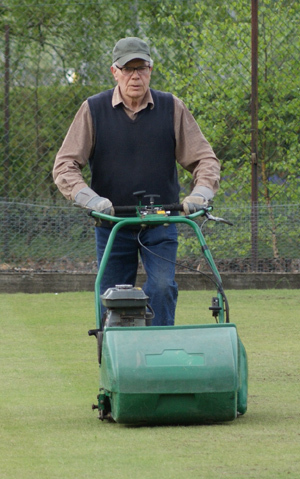 Away from the playing side of the Club, following the large outlay on a one-off treatment by a professional groundsman last year, the efforts this season of new recruit Des Robinson and his colleagues has seen a vast improvement in the quality of the Green, which has received many comments of approval from visiting players. 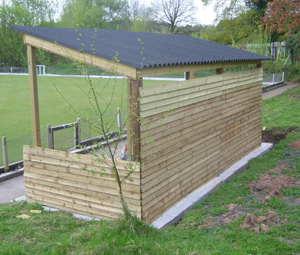 The Club continue to work on improving the facilities, so watch this space! 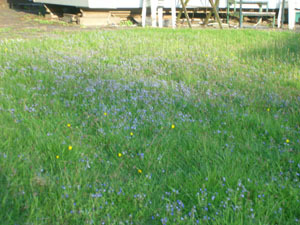 You will have noticed the improved condition of the green this year. 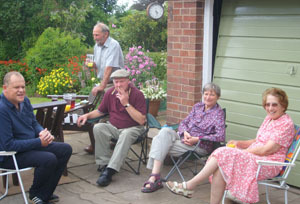 A lot of this is due to the hard work of Des Robinson and his colleagues, and here they are hard at work in June. 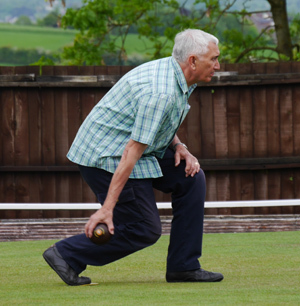 We're not just 'fair-weather' bowlers at this Club! The Club wishes to extend its best wishes for a speedy and full recovery to Alan Corbett's wife Jill. 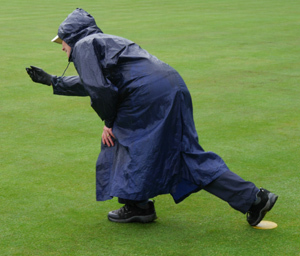 As some of you will know, on April 30th, the Saturday League match was cancelled because of a hail-logged green! 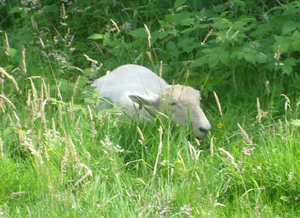 What was Robert Browning thinking when he wrote "O to be in England now that April's there"?! 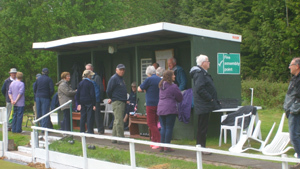 Many thanks to all those who turned up to ready the Club for the new season, which is only a couple of weeks away. 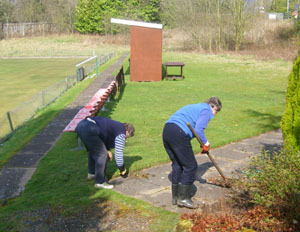 Thanks to the hard work of the ladies who came along (Anthea, Jane and Renee) the Clubhouse and Toilet are bright eyed and bushy tailed, and whilst there's still a bit of work to do on the Green and surrounds, the bulk of this job has been done, and the Monday afternoon team should have everything done by the time the season starts. Speaking of which, Friday social bowling will resume on March 25th (Good Friday). 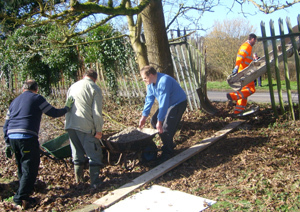 We are having a clean-up day on Friday, 18 March 2016 at 2.00pm. Below is a list of the work we hope to do, and we hope as many of you as possible will come along to help. Sorry for the short notice but with Easter being early this year it limited our choice. The Club wishes to extend its sincere sympathies to Mick Wainwright, whose wife Davina has sadly lost her long battle against illness. 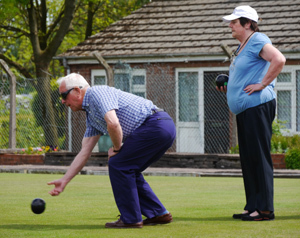 Davina was always very supportive of Mick's bowling, and none more so than when Mick picked up the trophy for being best performer in the Stoke League team in 2015. May Davina rest in peace. 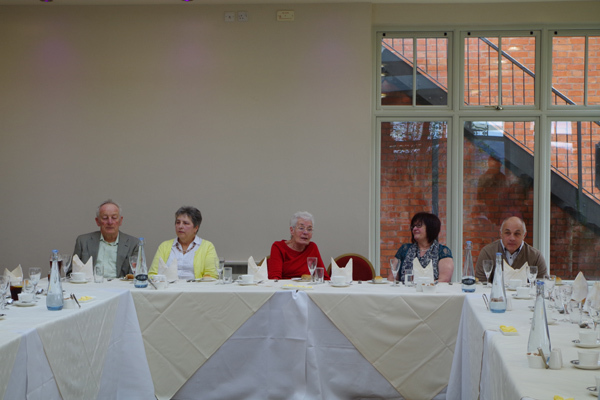 For the second year running our lunch venue was The Upper House in Barlaston. 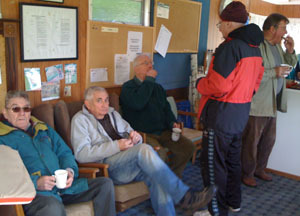 A windy but not unpleasant day (considering it's February) did not stop 32 people attending. 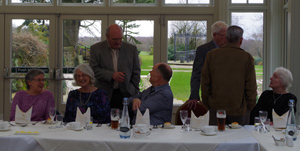 Everyone seemed to have a good time, and in his address, Chairman Gareth Jones announced apologies from those who were unfortunately unable to attend, and then gave a warm welcome to new members who were joining this occasion for the first time. 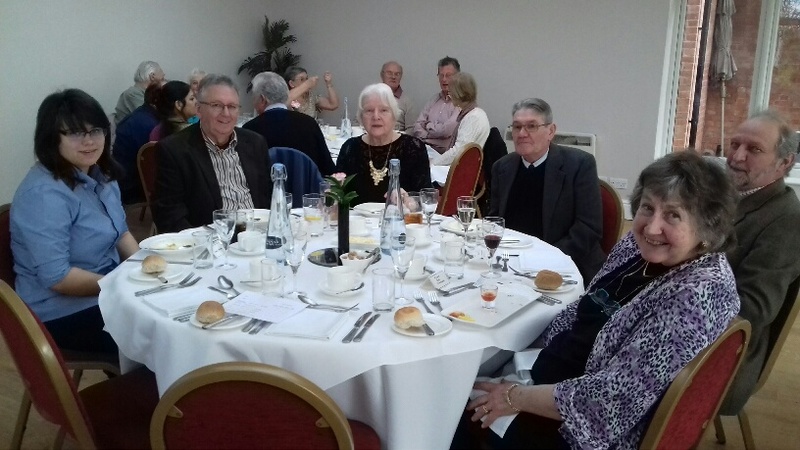 He also thanked new Secretary Renee for her excellent organisation of the event, and Treasurer Andrew for ensuring the Club had sufficient funds to supply the drinks for the lunch. 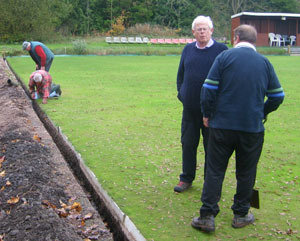 Gareth also commended the work of the Monday afternoon Work Party for their efforts on the Green and surrounds, and was hopeful that as the overall site is developed, St Modwen will endeavour to improve the infrastructure around the Club grounds, although this may be a year or two in the future. Please arrive at The Upper House from 12.30 for a 1.00 pm start. 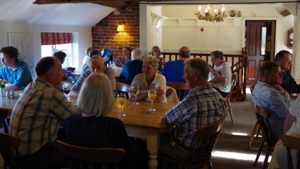 The Club will once again pay for your drinks, but please try not to take too much advantage of the Club's generosity in this regard. 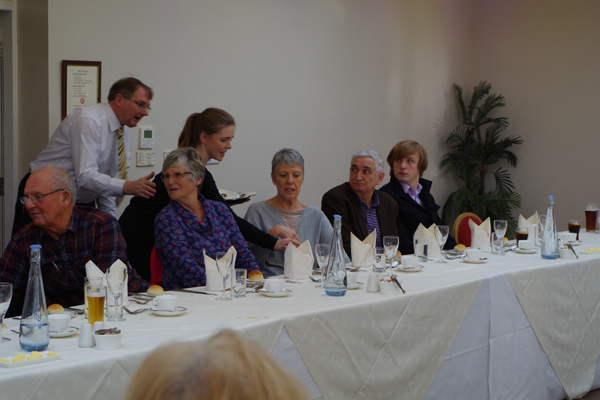 The Treasurer will take payment for the lunch on the day, and will also accept payment of the annual Club subs. Above all, have a good time! 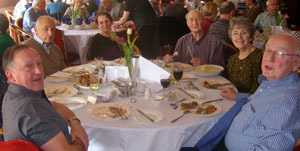 The menu is now available from Renee, and has been sent to those members on email. If you are aware of anyone planning to attend who is not on email, please pass a copy on. 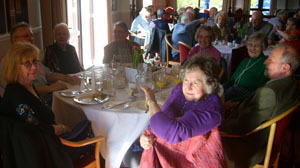 Renee needs to know your choices prior to 14th February, and any special dietary requirements should also be made known. 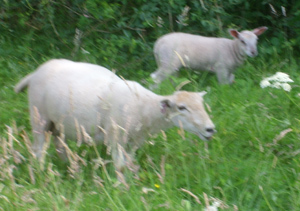 The cost will remain £18 per head. 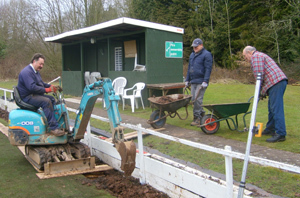 Despite the intrusion of the festive season, work has continued apace at the Club. 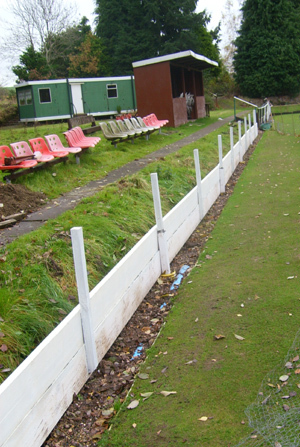 New fencing has been installed in front of the 'away' team seats, and the plan is to build up the ground behind the fence in order to virtually eliminate the dangerous dip that previously existed. With effect from 12.00 noon on Monday 7th December, the code number for the entry gates will change. The new code will not be posted here, but anyone on email has been advised. An update on the generator situation - the new toilet system only requires occasional use of a generator, and we hope to be able to borrow generators as and when we need one. 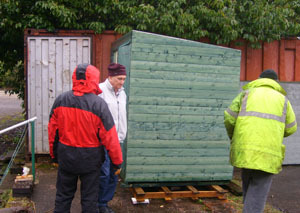 As some of you will know, the Club suffered yet another break-in last week (around 24th/25th Nov), and the most valuable item taken was the Generator. Not only did this have significant monetary value, it was also a key component in our new toilet system, so is unfortunately quite a blow. The relevant authorities have been informed, and any updates on the situation will appear here. 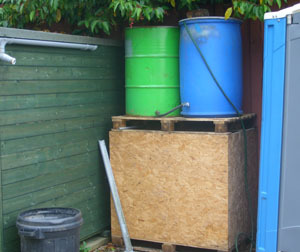 Earlier in the week we procured three large water tanks as part of the toilet function, which hopefully will not be in vain, despite this latest setback. 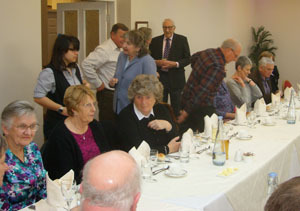 Thank you to all who attended the Club AGM. 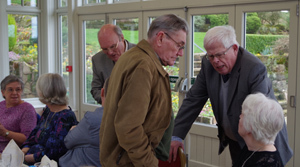 The changes to the elected Officers are now reflected on the Contacts page, and the full Minutes are available on the Membership page (click on them to see them full screen). 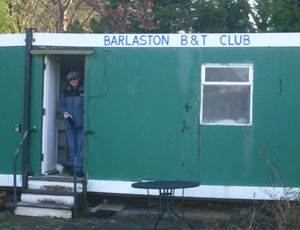 The Club AGM will take place on Thursday 12th November at 7pm in the Ruth Dickson room at Barlaston Village Hall. Please make every effort to attend as there one or two vacant positions to be filled, and some important matters to be discussed. If you know anyone not on Computer or email please let them know these details. Once again pride of place goes to the Ladies team, who finished in 6th place (out of 12) in their League. In common with all our teams, it was the home form that stood them in good stead, and they also managed one win on the road. 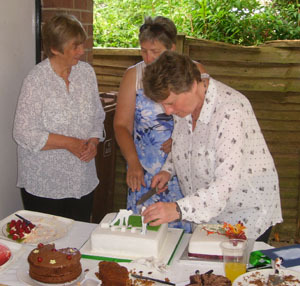 Carol Duffy picked up the individual honours, and was presented with her trophy by Pam and Margaret before their departure. After initial concerns about a lack of players, the Men's team ended up having to adopt a rotation system. They finished 9th (out of 12), mainly due to 9 home wins, but unfortunately they were unable to win away, despite twice coming very close. 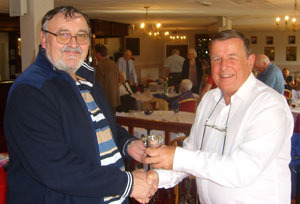 Mick Wainwright picked up the individual honours, and was presented with the trophy in front of his very proud wife by Captain Keith Hughes. 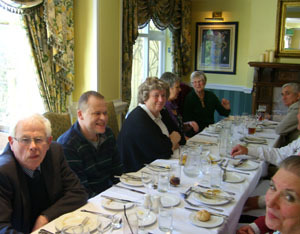 The Oakhill team started the season very well, but then faded, and eventually finished 10th (out of 12). Seven home wins were backed up by one away win. The Saturday Mixed team finished 8th (out of 11). 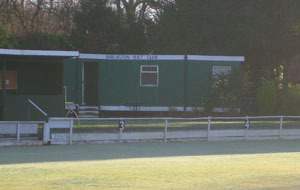 The Team won 9 out of 10 at home, which was the second best record in the League, and also managed two away wins. 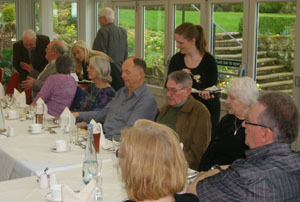 Well done to all the new Captains, and their deputies, who have kept all the teams running smoothly this year. 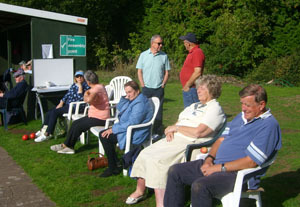 Off the field the Club gained ten new members over the summer, which was much needed after the loss of the Marshalls and Beechs last year, and the more recent departure of Pam and Margaret. 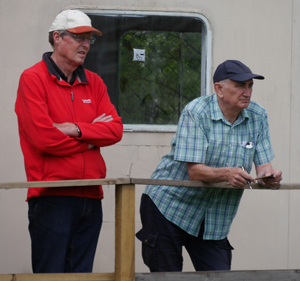 Various positions are up for grabs for the new season, and it is hoped there will be no shortage of volunteers at the forthcoming AGM. 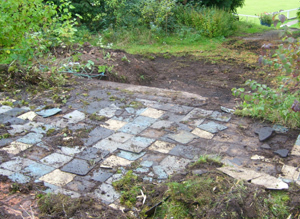 The green has been subject to a major restoration effort on Thursday 1st October, which it is hoped will lead to a much smoother surface next year. 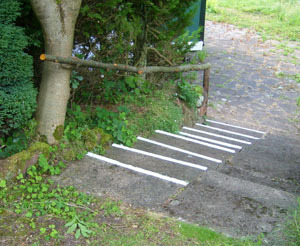 Consequently the green is now out of bounds until further notice. 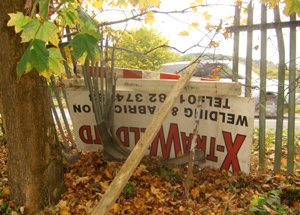 This is obviously unfortunate in view of the current indian summer, but the long-term future of the green is paramount. 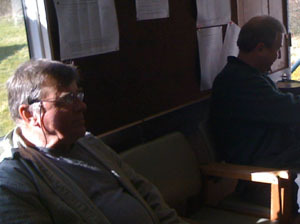 The Monday afternoon team, under the leadership of John Plant (and with a little help from Heath Robinson!) have rigged up a system which will enable the Club Toilet to function again, until such time as the water supply is restored. 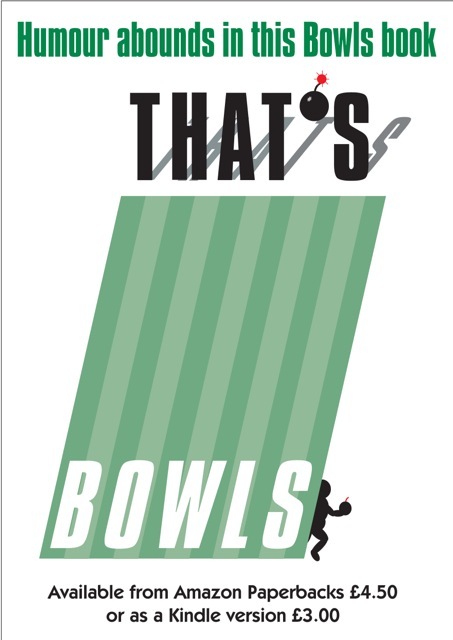 Members may like to be aware that a fictional book has been published which reflects the humour that can be found within the bowling community. I've no idea of its quality, but if anyone wants to purchase it, details are below. 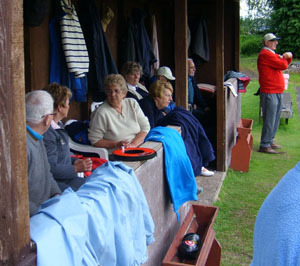 Due to inclement weather, the Friday afternoon (Aug 14th) friendly against U3A was cancelled. If an alternative date can be found, it will be announced here. 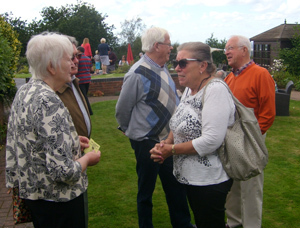 We were blessed with fine weather for what proved to be a lovely afternoon, and it was great to see such a large turn out, which reflects the high esteem and love felt for two ladies who will be sorely missed in many ways. 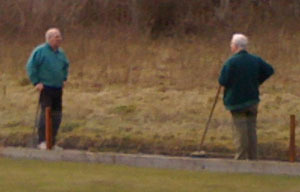 Many thanks to Gareth for providing the venue (although those who tried to have a bowl found the green rather slow! ), and to Renee for co-hosting. 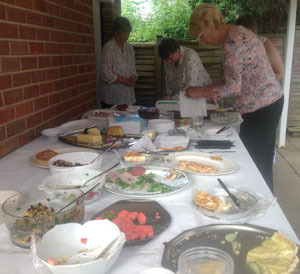 Thanks also to those who contributed to the fabulous spread, which was thoroughly enjoyed by all. 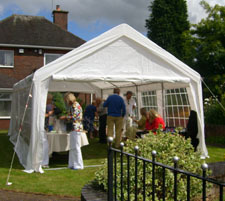 "We really appreciate all the efforts everyone made to make the Garden party such an enjoyable and memorable occasion for us. 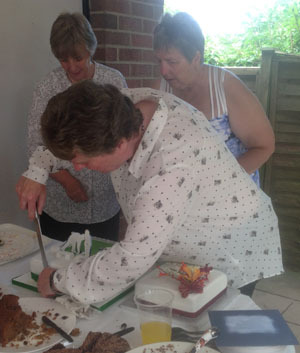 The catering was excellent and the cakes were works of art. 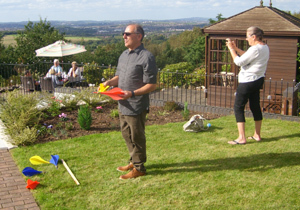 Special thanks to Gareth and Renee for hosting it and providing a beautiful setting and perfect weather. Many thanks to you all". 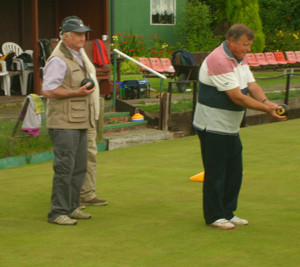 Friday 14th August will see what has become almost the annual friendly match against U3A. Please contact Brian and/or Rose if you are willing/able to play. Coaching Day on this Friday 31st July CANCELLED, due to unavailability of coaches. 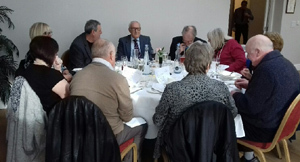 The Club apologises to all who have made special arrangements to attend and help out, and it is hoped the day can be arranged at some time in the future. This date is rapidly approaching and there are just a few places available - BOOK EARLY (with Adele) TO AVOID DISAPPOINTMENT!! 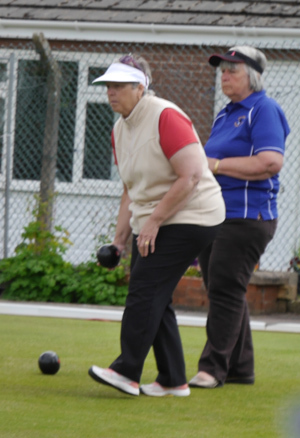 Once again the Ladies team are leading the way, currently lying 4th in their League, having won 6 and lost 6 of their matches, including one away win.Several individuals are figuring highly in the current player averages according to the League website. The Oakhill team are perhaps not quite performing to the level of recent seasons, as they currently lie 7th in their League. They've won 6 and lost five of their games, including one away win. 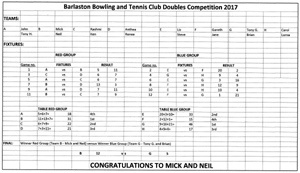 The Saturday Mixed Team are also struggling a little, as they are currently 9th in the table, having won 4 and lost 5 of their matches. Again they have picked up just one away win. The Men's team are also 9th, having won 5 and lost 7 of their matches. They have yet to win away, despite twice having come within a handful of points of that achievement. Current player averages according to the League website are: Bill 2.90, Carl 0.00, Keith -0.11, Mick W -0.60, Neil -1.20, Brian -1.44, Dave -2.17, Andrew Maddams -2.33, Arie, -3.10, John -3.50, Andrew Marshall -4.67, Mick M -6.10, Ralph -19.00. 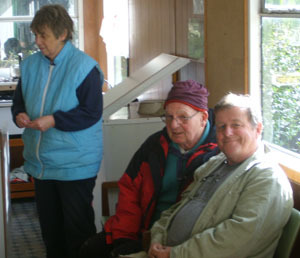 Special praise is due to Bill and Mick W who are both performing brilliantly despite difficult home circumstances. Overall the Club is recovering well from the loss of several stalwart players from previous seasons, and it is heartening to see the healthy number of new players who have been recruited, some of whom are already making good contributions to League teams. 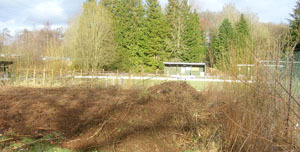 The closure of Meaford Road has had one positive effect, in that home games are much quieter, but the lack of a water supply remains a frustrating issue. 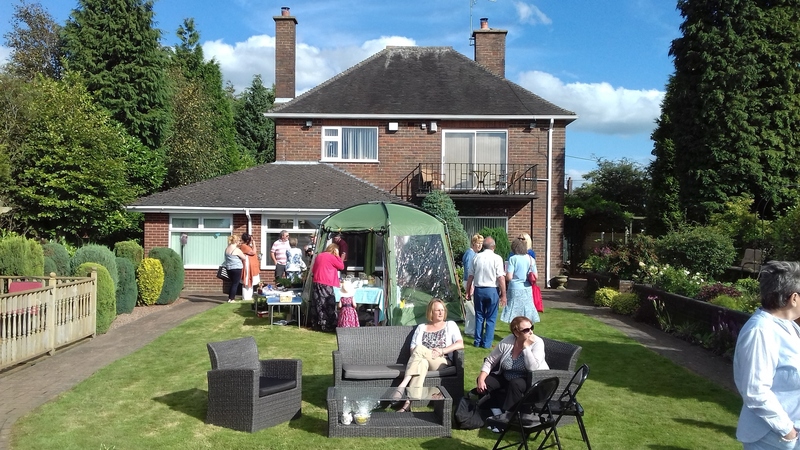 On the positive front, two big events are ahead of us, a Training Day and a Garden Party (see below), which hopefully will both be well-supported, and we look forward to improved League results in the second half of the Season. 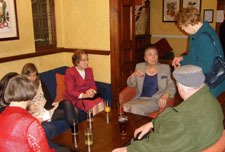 One of our new members, Adele Leigh, has kindly arranged a training day at the Club. There will be no charge for the course, and refreshments will be provided by the Club, so you really have nothing to lose except your time! Its a very honourable event as we have Mr Tizard (National Coach), Bob Marsh ( Regional Coach for Staffordshire, Warwickshire & Worcestershire) and Brian Chamberlain - BCGBA Lead Video Coach attending. 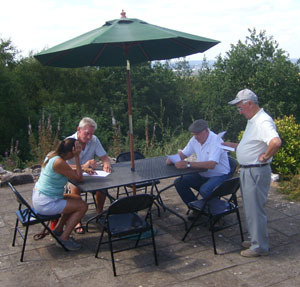 Adele will be taking one group, Bob Marsh another and the other two groups will be taken by those who are having the assessment for level 2. 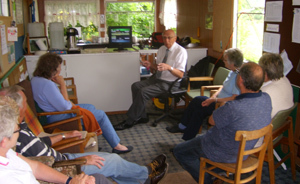 Brian Chamberlain will be taking each group for video coaching throughout the day. We need to have at least 15 people to partake, and it is hoped that as many of you as possible will take advantage of this wonderful opportunity. Full details of the FREE course are provided in the leaflet below (click to see full screen), and please let Adele know if you are planning to attend. 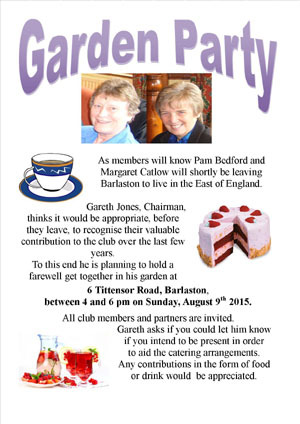 In order to recognise Pam and Margaret's massive contribution to the Club, Chairman Gareth Jones will be hosting a Garden Party in their honour. All Club members and partners are invited, including Friday social bowlers. The below invitation (click to see full screen) is being emailed to as many members as possible, and hard copies are available for anyone who cannot be contacted electronically. 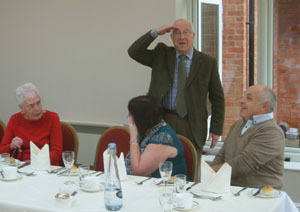 You will notice that Gareth would appreciate an indication of your attendance in order to assist catering arrangements. 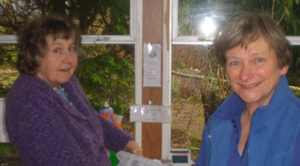 It will undoubtedly be a day of mixed emotions, but hopefully as many of you as possible will come along to say a fond farewell to Pam and Margaret. Watch this space for news of an exciting coaching day at the Club - details to follow later. 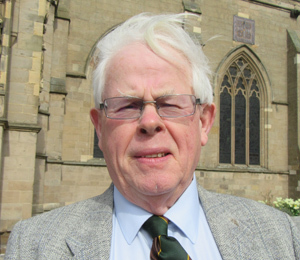 Members should be aware that Club Officials, led by Chairman Gareth Jones, are in constant contact with both St Modwen and Severn Trent Water in an effort to resolve the current unacceptable water situation. 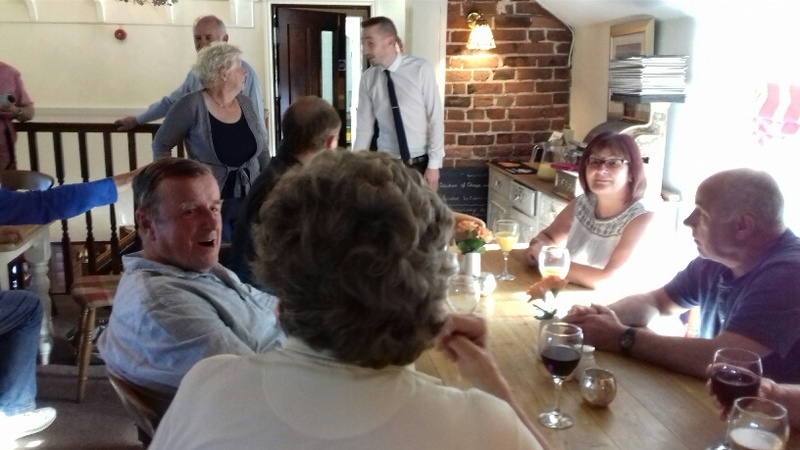 Two more potential new members came along and gave us a try on Friday 5th - a warm welcome to Liz and Graham, and we hope to see much more of you. 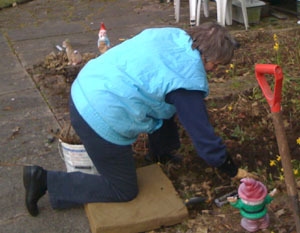 Delighted to report Anthea is now back home, and hopefully will be back showing off her skills before too long. 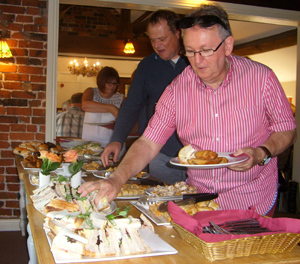 Visitors to the Club can currently enjoy a colourful experience. 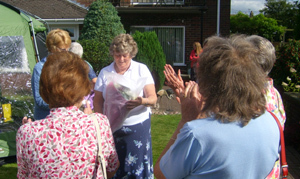 The Club would like to extend its best wishes to Anthea, and hopes she has a full and speedy recovery. 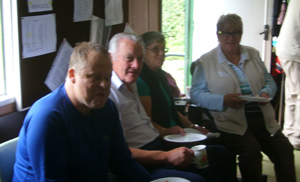 This perhaps a good time to thank everyone involved in our recent 'recruitment drive', and to extend a warm welcome to new members, Ralph, Dave, Bill, Jane, Steve, Adele and Di. 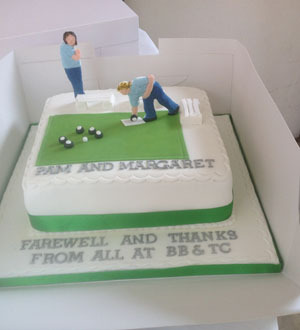 We hope you enjoy bowling with us and will stay with us for years to come. Those of you who have been recently "inconvenienced" at the Club, will be pleased to know a Portaloo has now been installed. 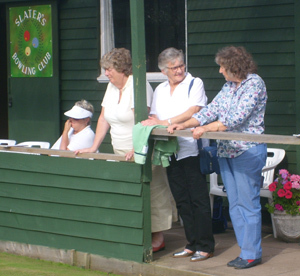 In case you are not aware, there are links on the Home page to the websites for the Ladies' and Men's Leagues, which provide more detailed averages/results etc if you are interested. 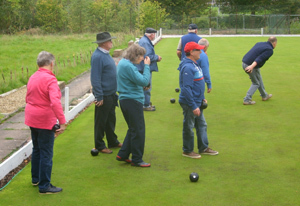 The Saturday Mixed Team began the season with a resounding home victory, and you will notice from their results page that Norton Central have withdrawn from their League, which releases two Saturdays from the schedule. 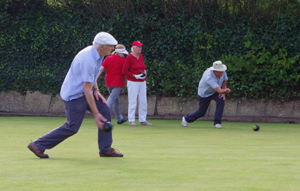 Barlaston WI have informed us they will resume their Thursday afternoon bowling on 14th May. 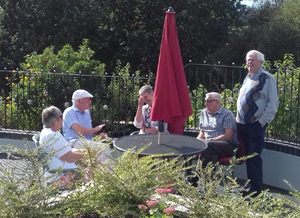 The first Friday afternoon social bowling of the season took place in glorious weather, and it was great to see some new faces, all of whom we hope were sufficiently encouraged to come along again, and hopefully in due course become members. The Ladies team fully exacted revenge for the Men's team result against Bucknall Ex, no doubt helped by a lot of support, including Mr and Mrs Boswell. 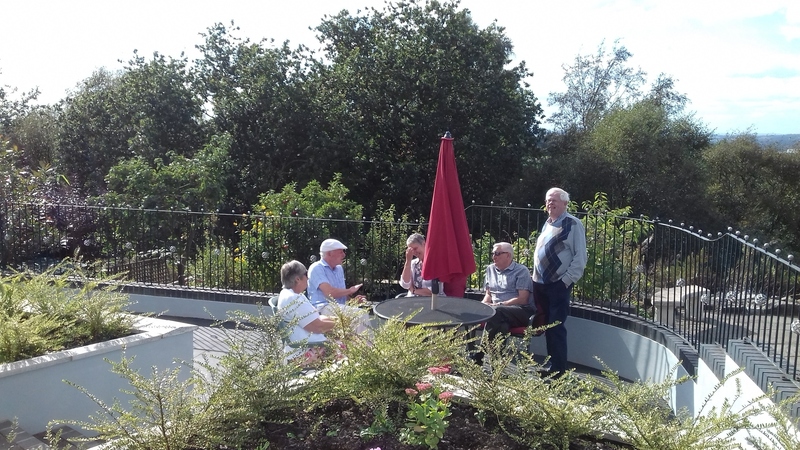 Thanks to everyone who came along to the two recent clean-up sessions - their work, together with the regular efforts of the Monday afternoon team, mean that we are all set for the start of the new season. 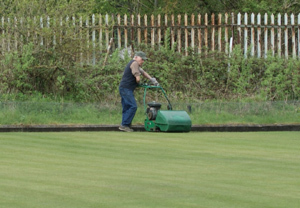 In addition the Green has been scarified (on 8th April) and the ditches weeded,, so we are all ready for the first home match of the season, which sees the ladies hosting Bucknall Ex on 9th April. St Modwen and Severn Trent Water have so far been unable to trace the source of the water leak, and have therefore turned down the water supply to a minimum. There is sufficient pressure for us to supply refreshments, but our newly-decorated Toilet is currently out of commission. 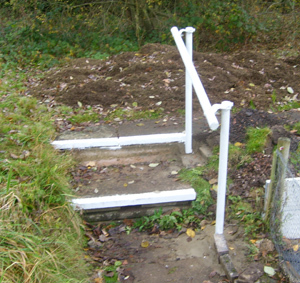 Fortunately, however, we have been able to secure access to the nearby toilet block, so apart from the inconvenience (pardon the pun) of a two minute walk, this problem has been resolved. The closure of the south (A34) end of Meaford Road has been put back to 8th May, with Rookery Lane closed from 27th April, but as most people approach the Club from the north (village) end of Meaford Road, this should hopefully not be too much of a problem. 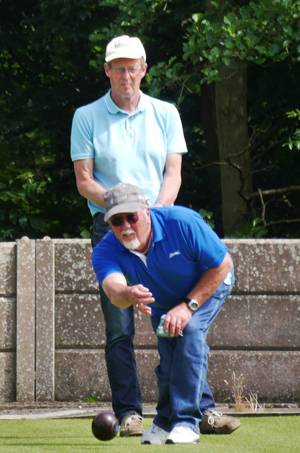 Unfortunately the men's team started the season with a defeat, but the good news was a return to competitive action for Bill Boswell, who only lost by the narrowest possible margin, and played like he had never been away - welcome back Bill! 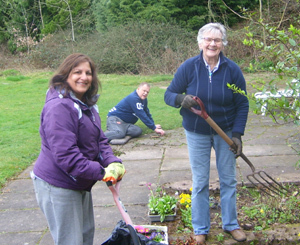 The threat of inclement weather saw somewhat reduced numbers on the second clear-up day, but there was still some good work done. The new season beckons! The 2015 fixtures are now on the website. All our teams are in 12 team Leagues this year, which leads to a more even spread of fixtures, as well as seasons of similar length. The 'Other Club Addresses' page has been updated with the 'new' teams we will be facing in 2015, and the 'Contacts' page has been personalised! 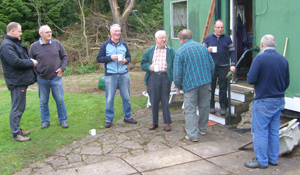 The first of two clear-up days took place on 23rd March, and some of the participants are shown here, both working away, and having a well-earned cuppa afterwards. 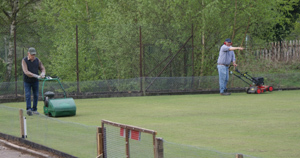 The Green is now safe to play on - the bobbles on the green are in fact a good sign as they are bits of dead moss. 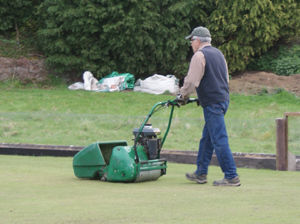 The second clear-up takes place on 30th March, and after that the Green will be scarified, ready for the first home match of the season on 9th April (ladies first, as it should be). Incidentally, all our fixtures will appear on this website later this week. 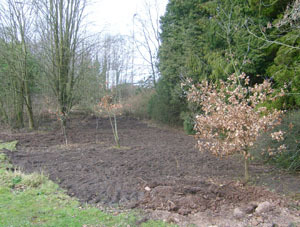 The green has been treated with some feed and moss-killer on 10th March, and to ensure that this treatment is most effective, it is strongly requested that everyone keeps off the green until further notice. 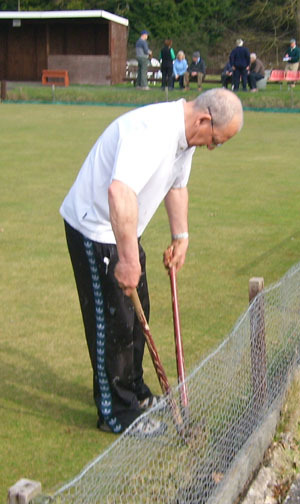 Unfortunately this means there will be little opportunity for practice on our green before the season-proper starts, but recent weather has been against us being able to treat the green any earlier. Unfortunately, the Club has been the victim of some vandalism, with the Toilet door being damaged. 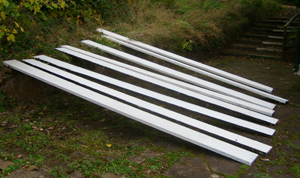 The door has been repaired, and the attack has been reported to St Modwen in the hope that they will make some efforts to improve security at the site. Incidentally, some of the potholes at the main gate have been (crudely) filled in, making the entrance a little smoother. There have been some amendments to the Team Captain line-ups for the 2015 season, and these are reflected on the Contacts page. 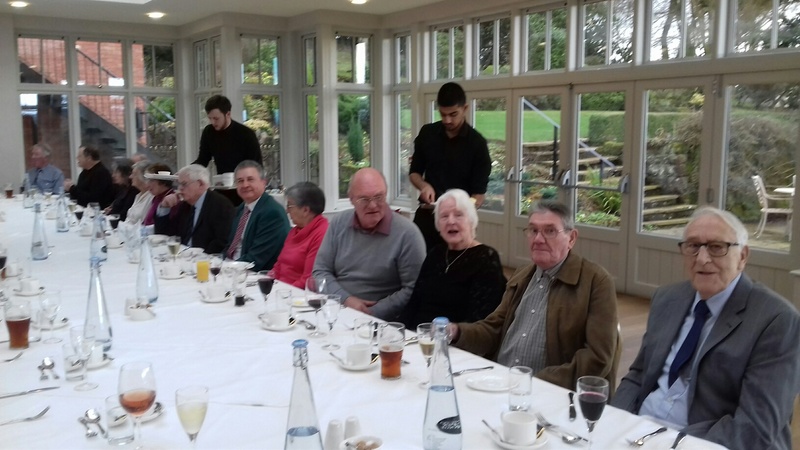 Despite blizzard conditions that would have made Robert Falcon Scott think twice, there was an excellent turn out for the annual lunch at a new venue, The Upper House in (appropriately) Barlaston. 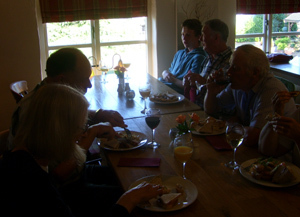 We were well looked after by our hosts, and the general opinion on the food was favourable. 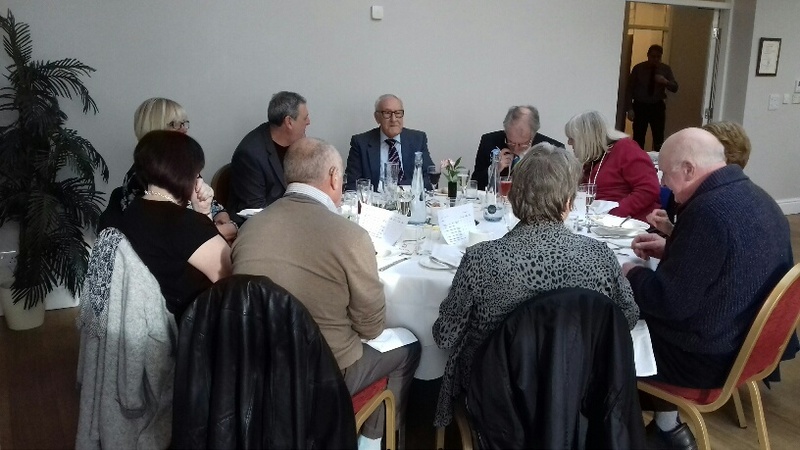 Chairman Gareth Jones took the opportunity to thank Arie for arranging the lunch, the Monday afternoon team for their work towards solving the drainage problem, and to Pam for her initiative in producing a leaflet which can be handed to potential new members, of which we need a few. 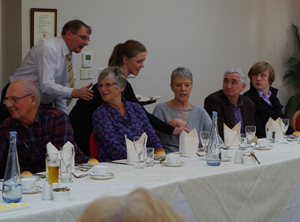 Everyone was also delighted to see the Boswells in attendance, and we hope to see more of them throughout the forthcoming season. 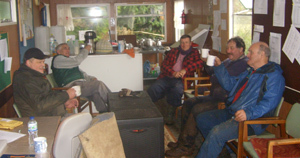 We are very grateful to the Monday afternoon grounds working group for all their hard work - even during the winter! 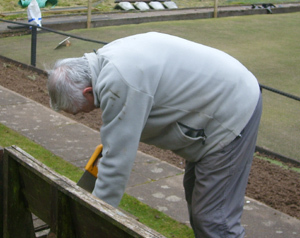 Since many hands make light work, they would welcome support from all those who can make it on either Monday, March 23rd or Monday, March 30th between 2pm-3.30pm to get the green and surrounds and clubhouse ready for the season. We know that the ladies start their season on April 9th so we need to be ready for then. 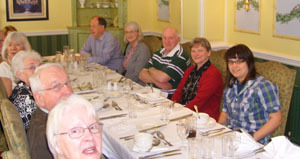 Don't forget the annual Club Lunch this coming Sunday (details below). Payment can be made to Andrew on the day, and annual subscriptions are also welcome. 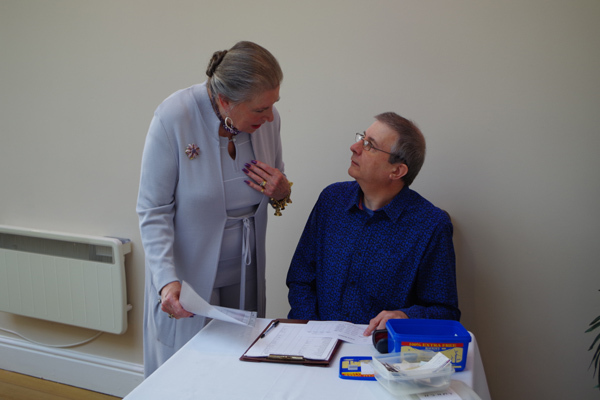 Don't worry if you've forgotten your menu choices - Pam and Andrew will have available copies of your selections. 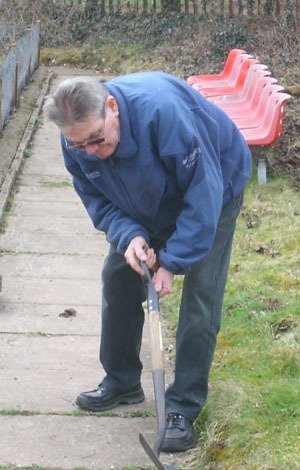 For those of you not aware, the Club unfortunately suffered a break-in, in which our petrol-driven strimmer, and a few smaller items were stolen. The matter has been reported to the police, and apparently this is one of a number of such incidents that have taken place in the Meaford Road area. Let's hope the perpetrator(s) are soon apprehended. 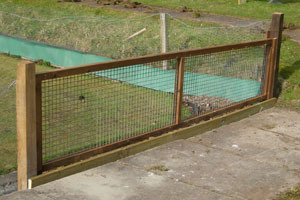 The wire fencing to keep out the rabbits has now been replaced, and new backboards have been fitted along half of the side of the green we have been working on. The inside of the toilet has also received its first coat of white paint. 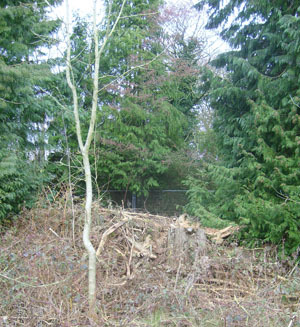 There's still plenty of work to do as time and weather permits. 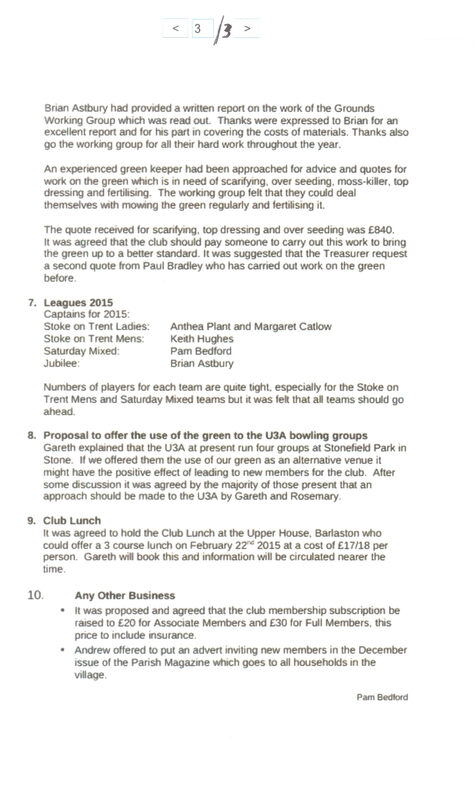 We have now heard back from U3A regarding our offer to make use of our green. 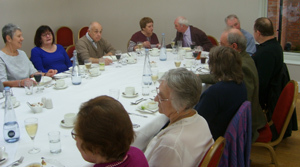 U3A have decided to continue using their existing facilities, although they did appreciate our offer. 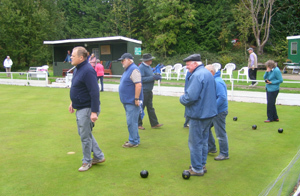 They have also noted that our Friday afternoon social bowling is open to allcomers, and so there may be a few U3A members who take advantage of that. 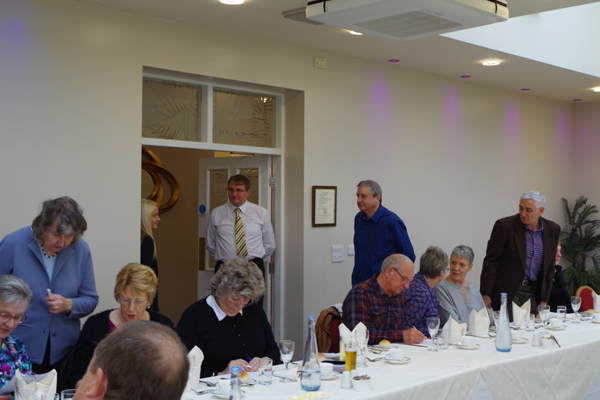 The annual Club Lunch will take place on Sunday February 22nd at The Upper House in Barlaston, ST12 9AE at 12.30 for 1.00pm. Cost per person will be £18, payable on the day to Andrew. 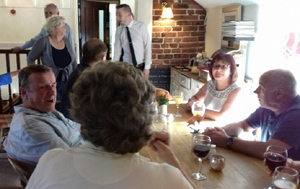 Menus are available now from Pam, and please let her know your choices in advance. 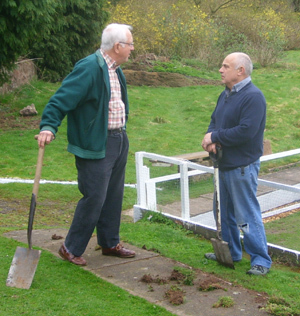 Following the recent AGM, a small 'sub-committee' met, and have decided to formally approach a Groundsman in order to carry out various 'one-off' jobs. 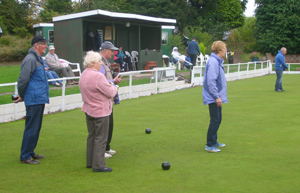 An offer has also been made to Stone U3A to ascertain whether or not they wish to hire our green at certain specified times. 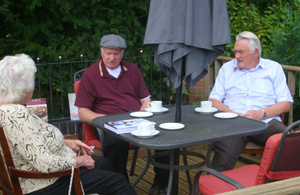 Furthermore, an appeal for more players will appear in the December/January edition of the Parish Magazine. 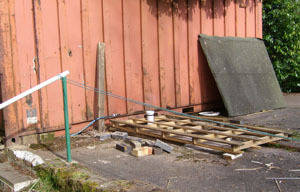 The trench has now been filled in to a certain degree, but some leeway has been left for the fitting of new (scaffolding) boards, to replace the rotten ones that have been removed. 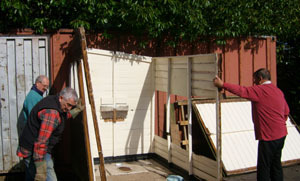 The new boards will be the next job, but as the weather worsens, the plan is also to paint the inside of the toilet. 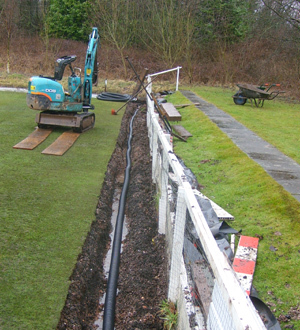 The new drainage pipe has now been laid along the entire length of the right-hand side of the Green, with short sections also turning the corners at both ends. 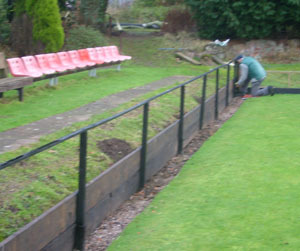 The next stage of re-filling the gutter has begun. NB 2014 AGM Minutes: Moved to Membership page. 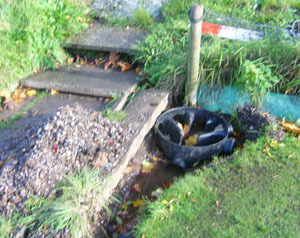 The drainage works have turned the corner - literally! 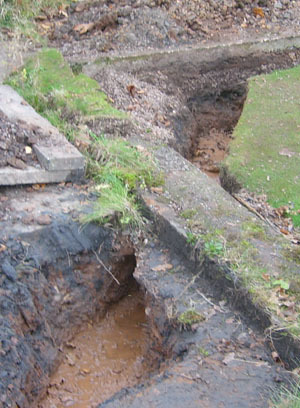 The trench has now been extended from the right-hand side of the green round to the back of the green, where the water will be allowed to drain away. There are already indications that the damp corner of the green is beginning to dry out, which is very engouraging for the grounds team. 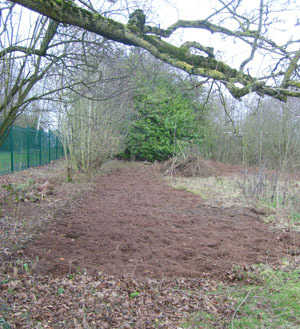 Next job is to complete laying the pipework, and then the trench can be refilled. 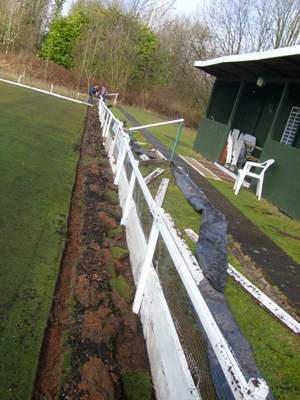 The trench works have revealed that the old scaffolding planks were rotten and will need to be replaced, so if anybody has access to any please let the club know. 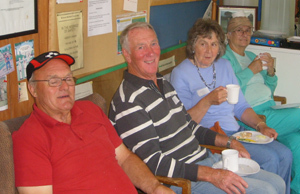 DON'T FORGET - AGM THIS THURSDAY OCT 30TH IN THE VILLAGE HALL AT 7.30. 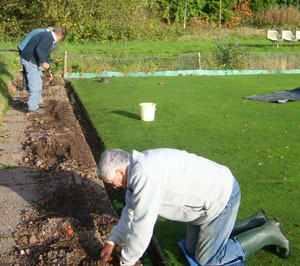 Work has continued apace, with a trench now dug along the entire length of the right-hand side of the green, and the new pipe laid to around halfway. Hopefully you can see from the first photo the ripples indicating the amount of water that runs into the damp corner of the green, so it is no wonder that so much damage has been caused. Work will continue as time and energy permits! 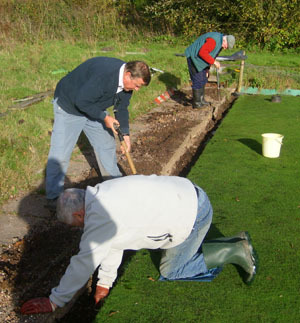 The Monday afternoon work party have started work on laying a new drainage pipe along the right-hand side of the green, which it is hoped will solve the problem of the damp corner of the green. 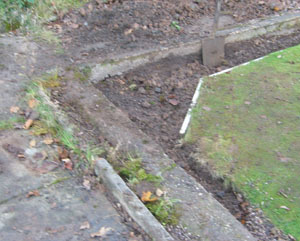 Interestingly, initial excavations have revealed that a (clay) pipe had been put in place when the green was originally constructed (possibly in anticipation of the current problems) but the pipe has become damaged and broken over the years and therefore has not been doing the intended job. Watch this space for further developments. 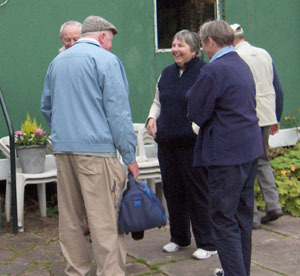 The AGM will be held on Thursday, October 30th at 7.30pm at Barlaston Village Hall. 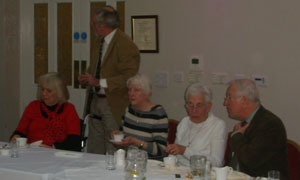 Obviously this is an important meeting and it is hoped that as many members as possible will be able to attend. Going into the final day, the Oakhill team seemed on course to finish second, but a rare heavy defeat, coupled with a strong win by their closest rivals , saw the team slip to joint 3rd (although officially 4th). The team won more away games than any other team in the League, and this, coupled with steady home form, undoubtedly contributed to an excellent overall season. Well done to all Oakhill team members! The final table for the Saturday team shows a respectable 7th place finish - if things had gone perfectly on the final day it could have been 4th, but that was always unlikely. An impressive home record of 8 wins out of 10, was backed up by a good 4 wins on the road, to record a solid performance overall. 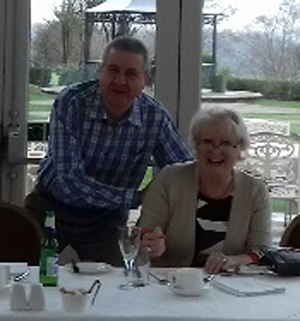 As mentioned below Ken and Janet did a splendid job as captains, and have a set a good standard to follow for next season's new captain. I suppose "improvement" depends upon how photogenic you are (! ), but it is now possible to click on the photos on this site and they will expand to full screen. 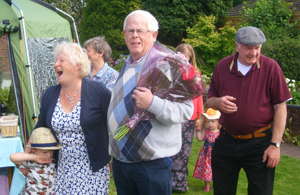 At the final Saturday Mixed league match of the season on 27th September, Club Chairman Gareth proposed a vote of thanks to Ken and Janet for their hard work this season in running 3 teams and they were presented with a planter full of flowers from the club. 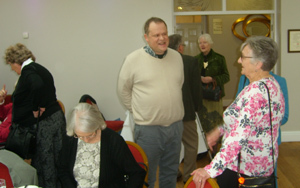 Many thanks to Margaret for providing some photos of both the match and the presentation. 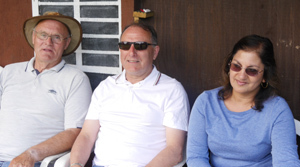 What a delight to have the Boswell family come and support the Saturday team on 13th September, and undoubtedly this served to inspire the home team to victory. 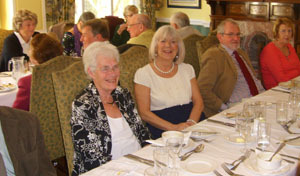 It was great to see Anne looking so well, and hopefully we will see Anne and Bill at (and maybe on) the Green much more next season. Our team in the Wednesday men's League have unfortunately finished 11th, and if you notice how many teams are in that League you will realise what that means! The team have had to cope without regular players Bill and Carl this season, and the new players that have been introduced haven't quite hit the ground running. Hopefully however this season's experiences will stand them in good stead in the future, where Division Six awaits. The final League table has now been published for the Ladies League, and our team have finished in a very creditable fourth place. The team were only 12 points away from finishing third, but that would have put them in danger of being promoted, and an insider advises that this was never the intention! 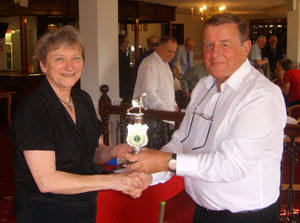 On an individual level, congratulations to Pam Bedford who finished 6th in the averages for the entire Division, although Pam would be the first to say it has been a real team effort, with everyone pulling their weight in the light of the unavailability this season of two previous stalwarts in Anne and Emma. Apologies to all that the website has been a little behind lately, but as many of you will know the website manager has been unexpectedly hospitalised. I'm now back (and so is the site) and would like to use this forum to personally thank Club members for your many and much appreciated good wishes. 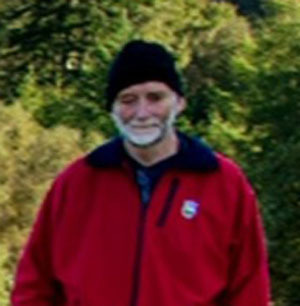 On a similar note best wishes go out to Neil Jeffs for a full recovery after his recent bike accident. 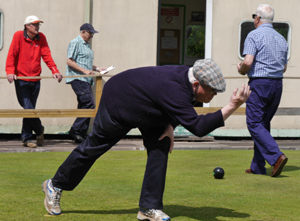 We're a poor old lot - maybe we should take up a gentle pursuit like bowling....! 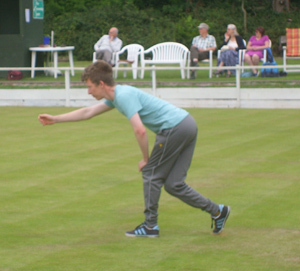 On Sunday 13th July Kyle represented Potteries & District against Lancashire in the third match of Section 3 of the Drakes Pride Junior County Championship. This time Kyle was selected for the away trip to Lancashire and travelled to Wigan where he enjoyed an excellent 21-16 victory - one of only two wins by the Potteries team. 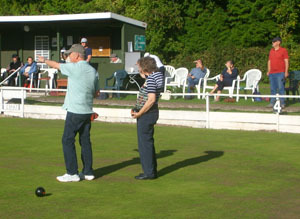 Unfortunately the team lost this match by 142 to 246, and the home match at Florence also saw a defeat for the Potteries by 248 to 139. 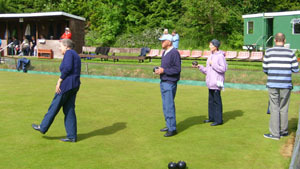 The Potteries team have therefore finished bottom of their section and do not qualify for the semi-finals. Nevertheless congratulations again to Kyle (and Emma) for representing their County. Come rain or come shine, he stands stoically at the side of the green, quietly urging on the home team to success. Nothing will deter him from this task, and there's no doubt he has an intimidatory affect on our opposition. 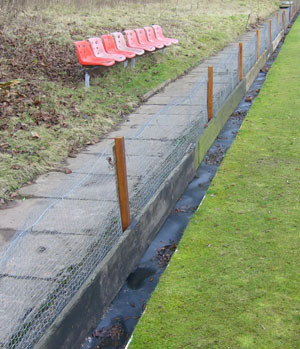 So, let's hear it for 'BARL-EE', the number one supporter of our Club. 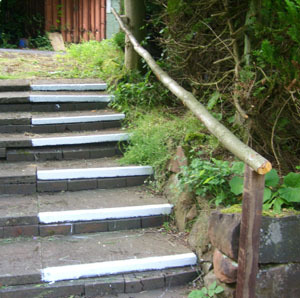 Following Jan Marshall's recent unfortunate fall, the Monday afternoon maintenance team have been working on improving the 'Health & Safety' aspect of the steps. The results are shown below and hopefully this will help to avoid such accidents in the future. 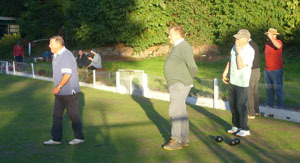 After a traumatic pre-season necessitating an EGM, it was good to just get out on the greens and bowl. Pride of place so far this season must be shared by the Ladies and Oakhill teams, both of whom are riding high in their respective Leagues. 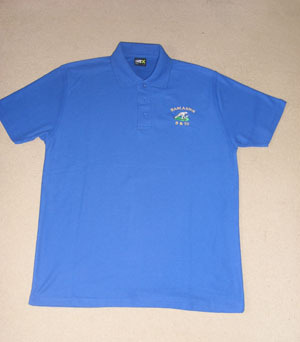 The Oakhill team have actually won more games away than at home - always the secret to success. The Ladies started with a 100% record for the first four weeks, and remain a force to be reckoned with in their Division. 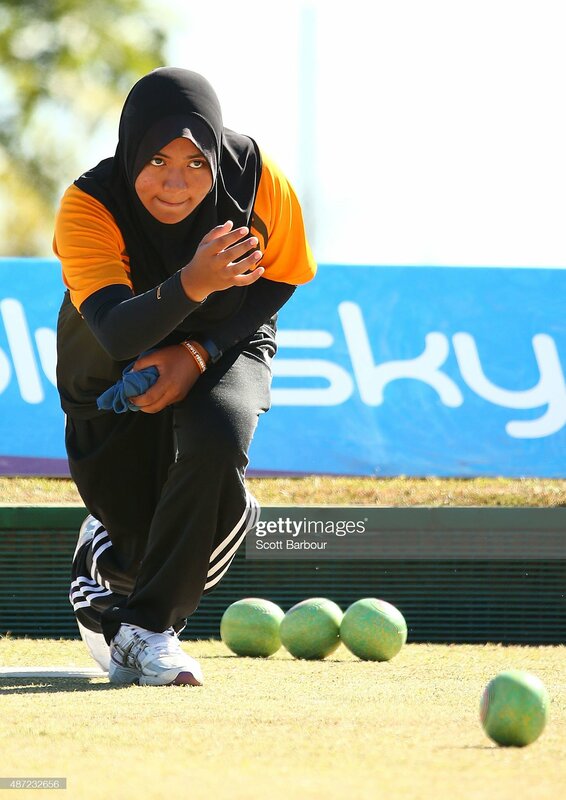 For the Saturday Mixed and Stoke Men's Teams it's been a different story. The Saturday team have a 100% home record (opponents finding our 'slow' green difficult to adjust to), but have managed only one win away. The Stoke Team have struggled through trying to bed in new players in the team, but hopefully this will have long-term benefits. 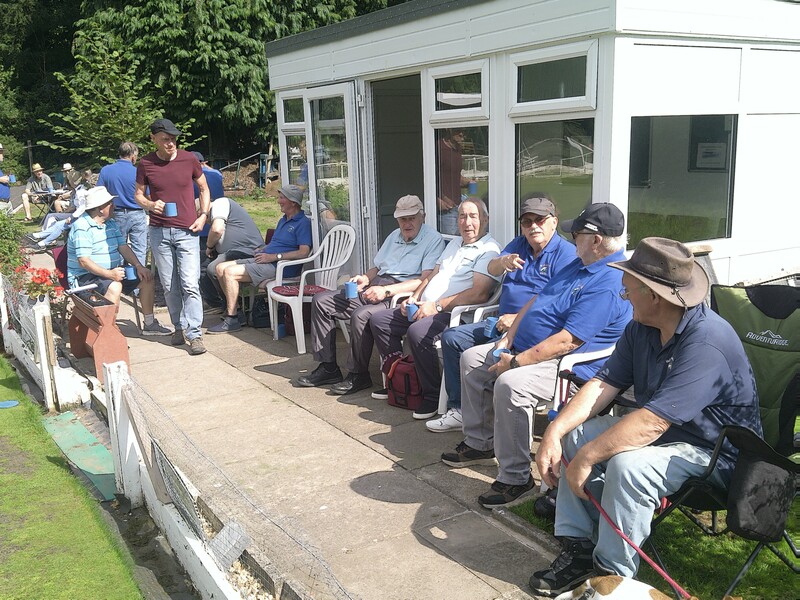 As a Club we can be proud of the way we are coping with recent difficulties, - the Boswell's (hopefully temporary) retirement, damp corner of the Green, negotiations with St Modwen, - and let's hope for a brighter future. 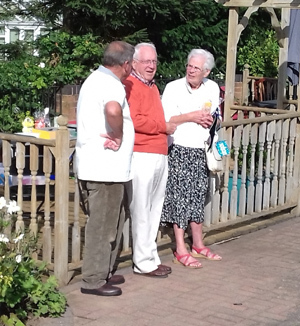 Particular thanks to Ken and Jan Marshall, and Anthea/Margaret for taking over the running of the League teams at such short notice. 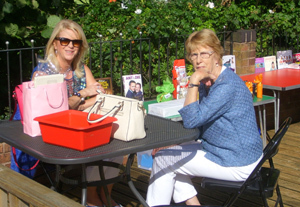 "Anne and Bill Boswell would like to thank everyone for the cards, telephone calls, prayers and not least, cakes, following Anne's stroke. Your support has been overwhelming and greatly valued! Anne is making slow but steady progress but unfortunately still has a long way to go, so your support has been invaluable. 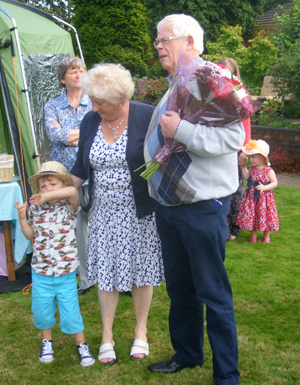 Many thanks, Anne and Bill". 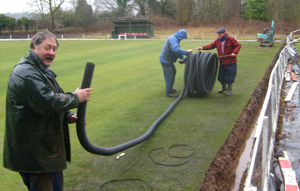 On Monday 16th June a drainage expert visited the Club, and concluded that our problem with the damp corner of the green could be solved by laying a drainage pipe about half a metre below the surface along the length of the ditch running along the front of the green (in front of the stand). 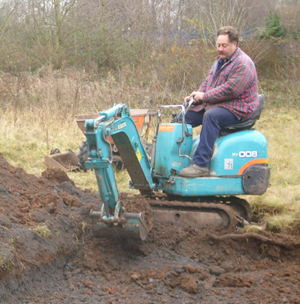 He will be sending us a quote for this work which obviously cannot be carried out until the end of the season. Once that work is done we will be able to consider how to treat the marsh grass problem. Watch this space!! 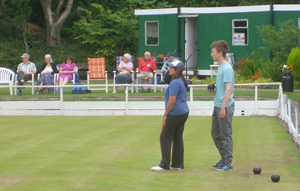 Our two young stars represented Potteries & District against Derbyshire in the second match of Section 3 of the Drakes Pride Junior County Championship on Sunday 8th June at Bucknall Private BC. 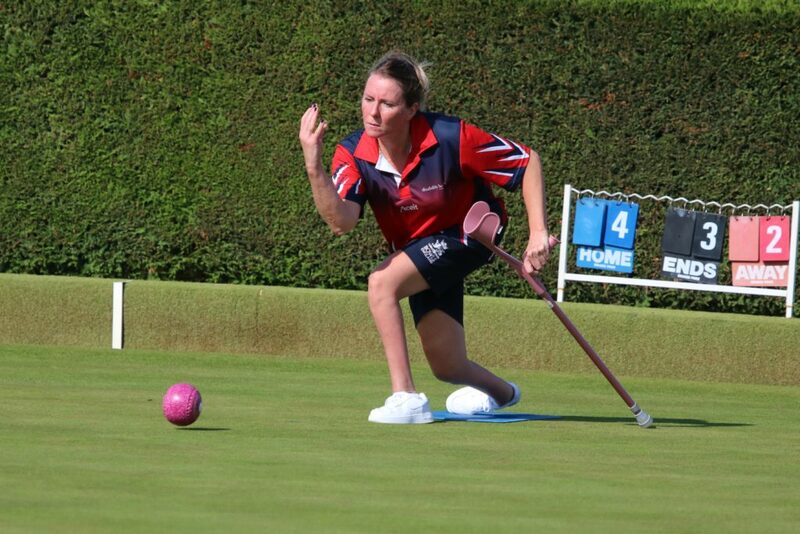 Emma Dawson was unfortunately beaten 10-21, whilst Kyle Marshall fared a little better in being beaten 16-21. 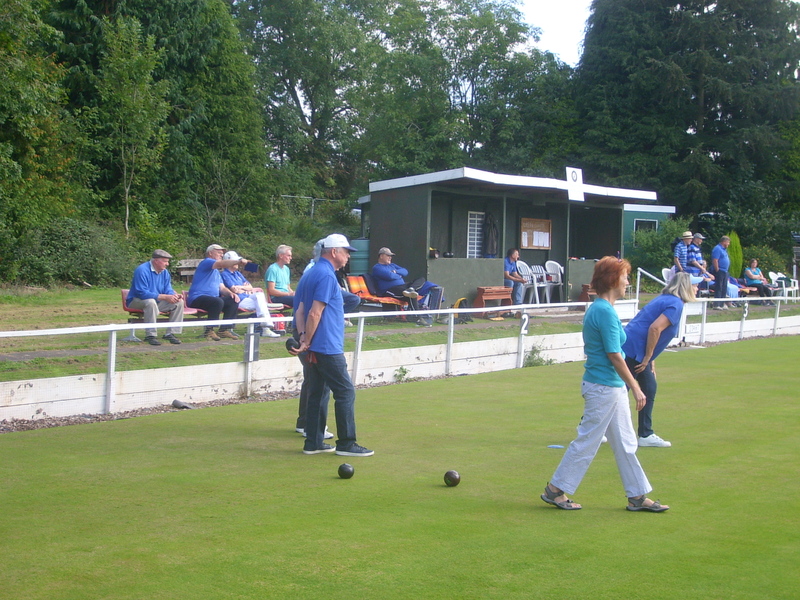 Potteries & District were beaten 157 - 235 in this home match, and the away team also lost by a similar margin 148 - 248. So, a disappointing overall result, but well done to our two young players for representing our Club and the County so well. The next match is against Lancashire on Sunday 13th July. Meaford Power Station - Following the initial consultations, Meaford Energy Limited are now ready to present their findings. 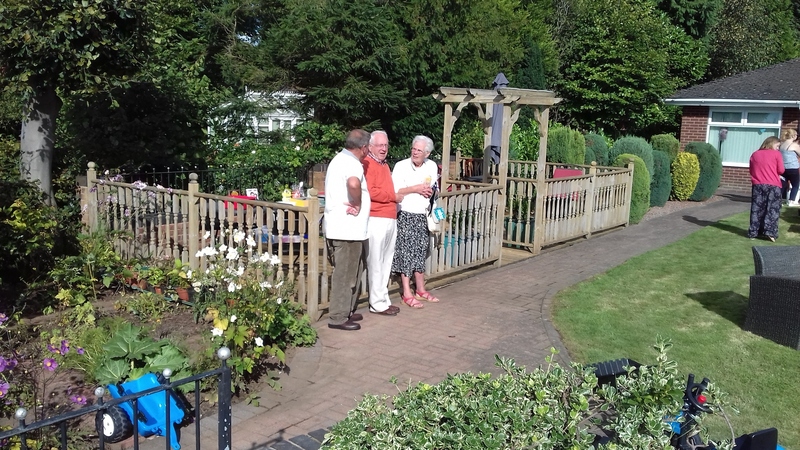 There will be two public exhibitions, the first at the Lakeside Tavern on Wednesday 11th June from 3pm to 8pm, and the second at Barlaston Village Hall on Thursday 12th June from 3pm to 8pm. Apparently they have listened to public concerns and are proposing to develop the south site, i.e. the one closest to Stone and furthest from our Green. Ref. 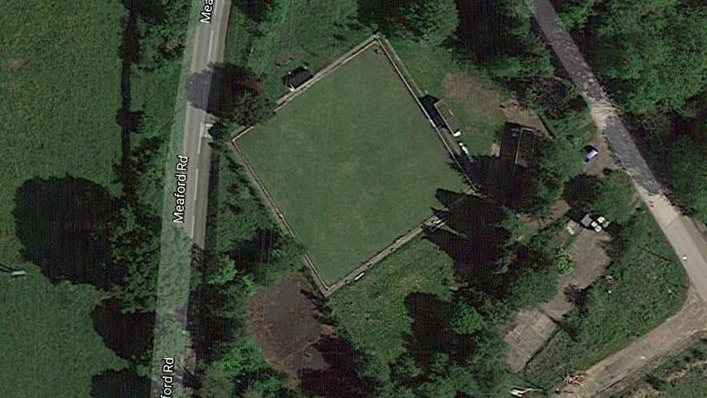 : Bowling Green at Meaford Power Station site. As we have been advising you over a period of time,part (getting larger all the time) of the green is constantly being soaked by water coming from the area of the access road. This part of the green has become sodden,causing the formation of moss and, more detrimentally, marsh-grasses which we cannot eradicate without killing off any "proper" grass. 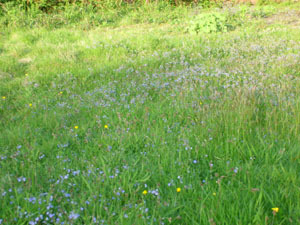 Neither can it be properly mown as the mower just rolls over the tufts formed by these grasses. 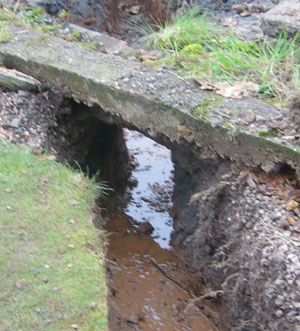 We firmly believe that this problem is caused by water leaking from the pool adjacent to the gatehouse and that by draining this pool the problem could be solved. 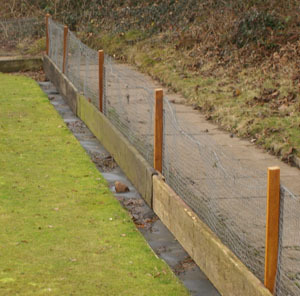 You agreed to have this looked at on an urgent basis and to let Arie know whether you can arrange for this to be done and when. We apologise for again stressing the urgency of this matter. 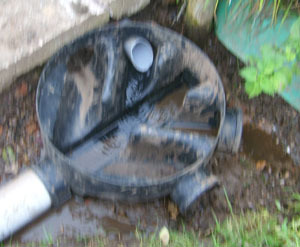 You and Arie also discussed the possibility of carrying out drainage work if emptying the pool does not solve the problem. That would, of course, be quite expensive and we hope that St.Modwen might be prepared to help with this. 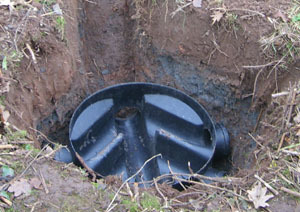 In any case, we would need your permission to carry out the work, as well as a drawing of the existing drains in the area in order to avoid any damage or unnecessary work and expense. We shall be pleased to hear from you about this eventuality as well. Let's hope this leads to some improvement. 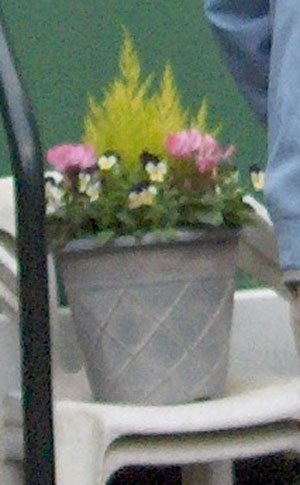 The Club has presented Anne and Bill with a planted decorative basket for the garden, for which they were very grateful. 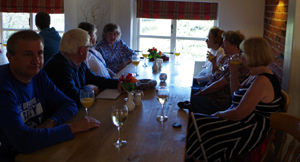 Anne seems much brighter now that she is home, and it is hoped that this gift alongwith the excellent start to the season by both the Oakhill and Ladies teams will hasten her recovery. For those of you not aware, the excellent news is that Anne Boswell is now back home, as she continues on the road to recovery. 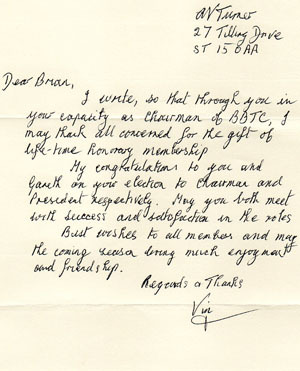 The Club wishes her and Bill all the best. 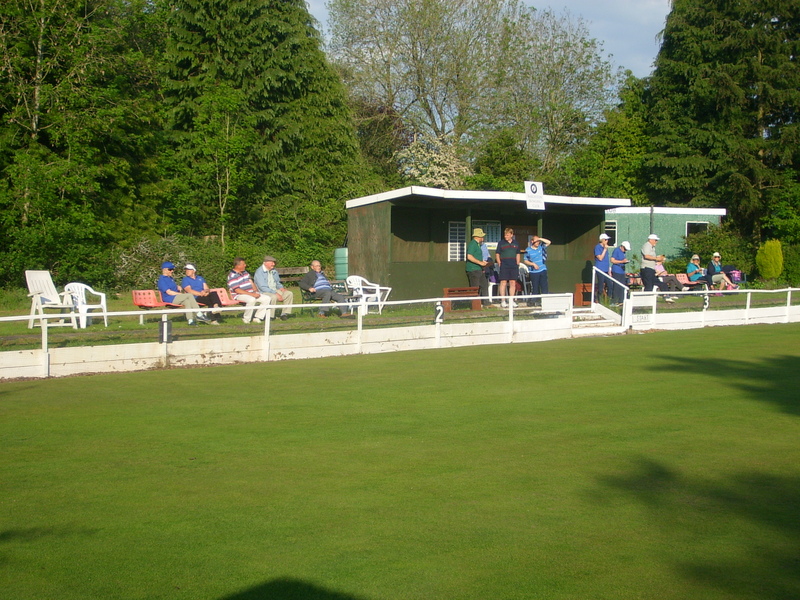 Our two young stars represented Potteries & District against Shropshire in the first match of Section 3 of the Drakes Pride Junior County Championship on Sunday 11th May at Bucknall Community BC. Emma Dawson played well but was unfortunately beaten 12-21, but Kyle Marshall strode to a 21-13 victory and was voted man of the Match. 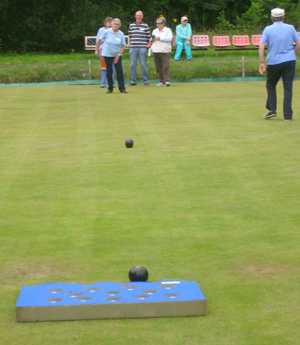 Potteries & District were beaten 160 - 229 in this home match, and the away team also lost by a similar margin 152 - 228. So, a disappointing overall result, but well done to our two young players for representing our Club and the County so well. 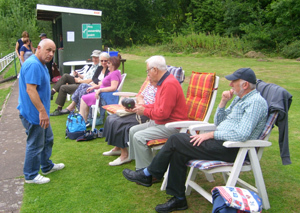 The next match is against Derbyshire on Sunday 8th June. Many congratulations to the Oakhill team, who started the season as they mean to go on with victory in arguably their most difficult fixture of the season by 7 points to 4. 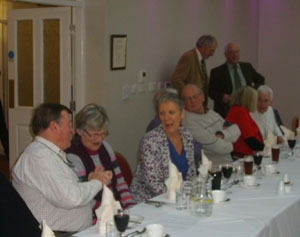 It would have been 8-4 but someone who shall remain nameless (new Club Chairman) was unable to attend. 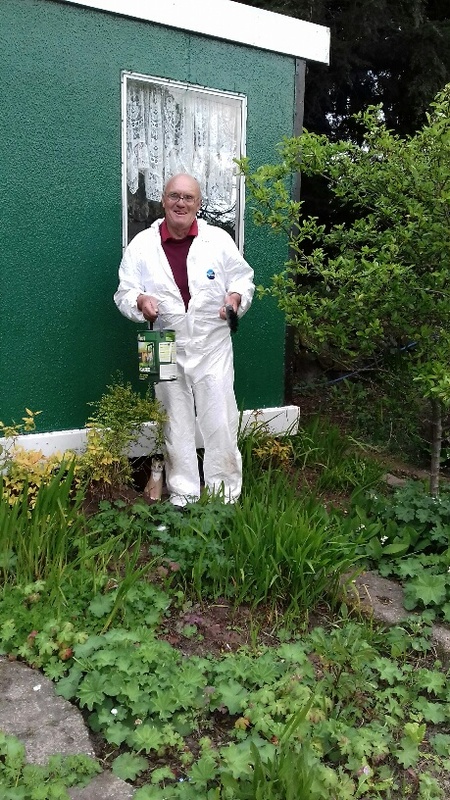 The new toilet is now functional, although has yet to be 'decorated' - many thanks to Keith, Brian, Alan and plumber Paul for their hard work in this regard. 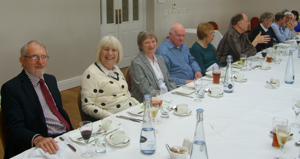 The changes that have taken place to the Club following the EGM on 25th March are now reflected on the History, Contacts, and Membership pages of this site. 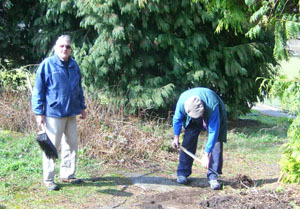 The annual 'Clear-up' day took place on Saturday 29th March on a glorious spring day. 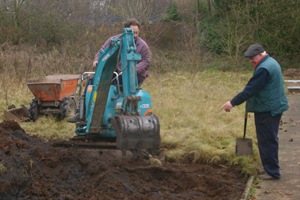 A good turn out saw a lot of work done, and with a bit more titivating to be done by the working party, as well as the plumbing-in of the new toilet, everything will be ready for the new season. Don't forget - Extraordinary General Meeting tonight (Tuesday 25th March) - details below. 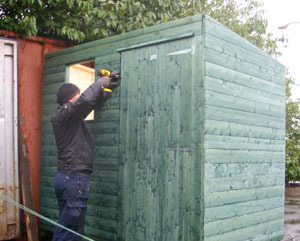 On a miserable day, the new toilet shed has been erected, although the toilet itself has yet to be plumbed in, so, until further notice, make sure you go before you leave home! 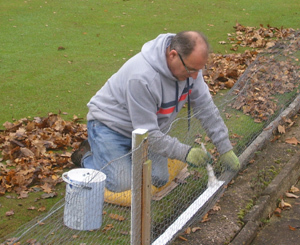 For those of you looking to get in some pre-season practice, please note that the green is currently out of bounds until Friday 28th March as it has been given some anti-moss treatment. 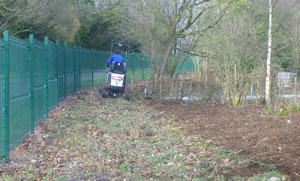 The green will therefore be ready for the clear-up day on Saturday 29th March - all volunteers welcome from 10.00 to 12.00. 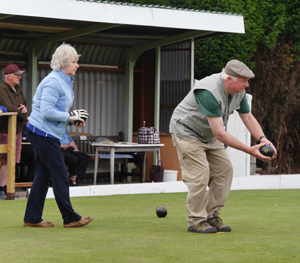 The Club would like to extend its warmest best wishes to Anne Boswell for a full and speedy recovery, and trust that she and Bill will be back on the greens leading their teams in the near future. 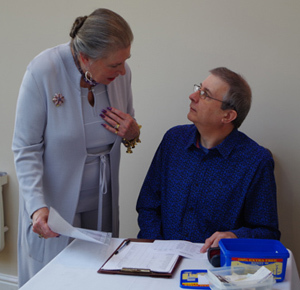 In the meantime a meeting has been called for Tuesday 25th March at 7.30 at the Methodist Church Hall which is in Park Drive, in order to discuss various issues that need to be resolved whilst Anne and Bill concentrate on getting Anne back to full health. As you all know Anne and Bill have been fundamental in the success of the Club in recent years and fully deserve our support at this difficult time, so it is hoped that as many of you as possible can come along on Tuesday to discuss how to keep the Club running in their absence. 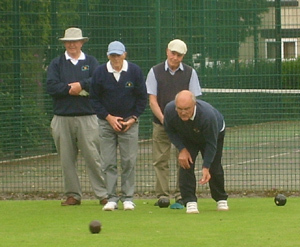 2014 Fixtures are now available for all our teams on the Leagues page. 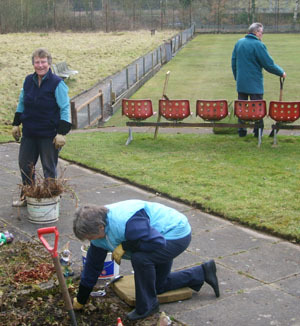 Saturday March 29th - Club clean-up day (all volunteers welcome). Tuesday 8th April - Oakhill Jubilee League first fixture. 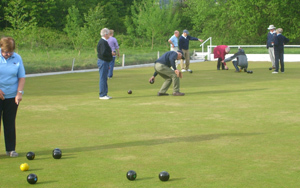 Wednesday 9th April - Stoke Men's League first fixture. Saturday 12th April - Saturday Mixed League first fixture. Thursday 17th April - Ladies League first fixture. 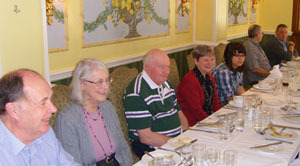 Sunday March 9th saw the annual Club Lunch take place at the Stone House Hotel on a glorious Spring day. 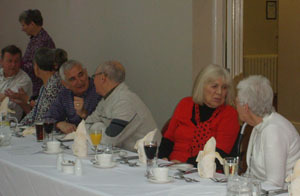 Here are some photos of the happy attendees. 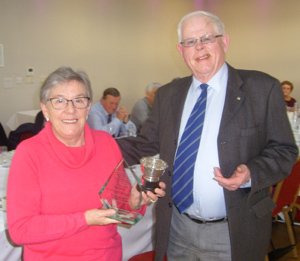 Congratulations to Emma and Bill who were presented with trophies for being the highest Club scorers in their respective Leagues. 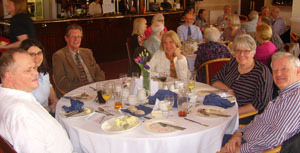 DON'T FORGET - next Sunday (9th) sees the annual Club Lunch. 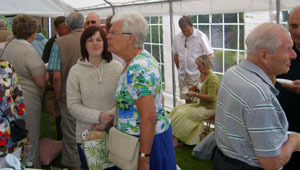 At the last count there's going to be 29 of us there so let's hope a good time is had by all. 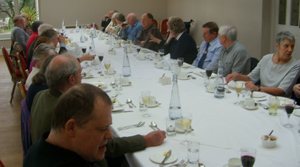 NB Please note that the annual Club lunch will take place on Sunday 9th March (not as previously advised) at the usual venue, the Stone House Hotel. 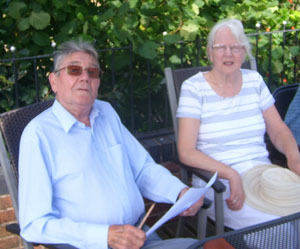 Menus are available from Bill and Anne. Other dates for your new Diary/Calendar: a clean-up session will be held on Saturday March 29th, with the possibility of carrying this over to April 5th. 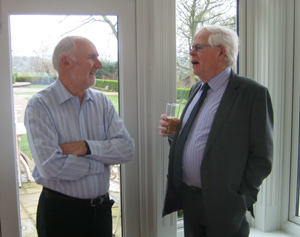 The Club wishes to extend its sympathy to the family of past Chairman, Roy Finney, who sadly passed away on February 8th. May he rest in peace. Happy New Year and may all your bowls nestle alongside the jack! Father Christmas will be delivering presents, but only if you've been good! As some of you may be aware, Meaford Energy Limited have published their report on the recent consultation process regarding the proposed development of a power station. 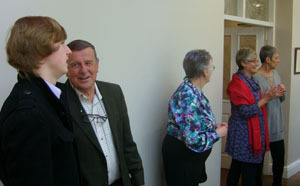 The full report is available in the Library section of their website, www.Meaford-Energy.com. 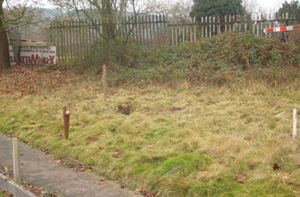 Of main interest to us is that most people were in favour of the station being built on the south site, which is the one furthest from our Green. We will keep you informed of any significant news in this regard. The Club wishes to extend it's sincere sympathy and best wishes to Gareth Jones on the sudden and untimely loss of his lovely wife, Jenny. May she rest in peace. 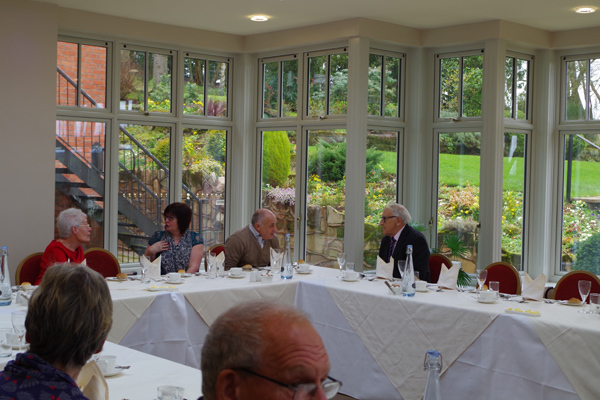 The AGM has taken place, and the minutes are available from Pam. 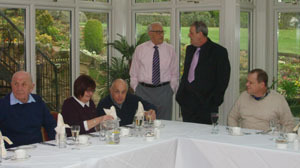 All Club Officers were re-elected so must be doing a good job! Congratulations and thanks to them all. A date for your diary. 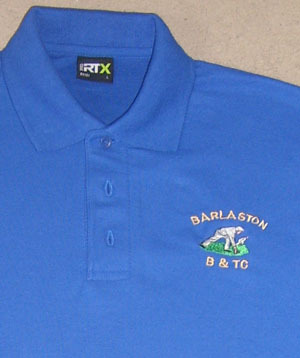 The Club's 2013 AGM will take place on Thursday 7th November at 7pm in Barlaston Village Hall (meeting room at rear). 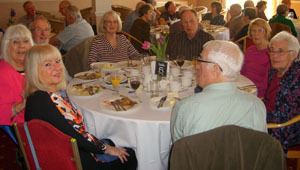 In the words of the Club Chairman "Please do try and attend, the future of the club is in your hands". Hopefully some of you attended one of the consultation events for the proposed Power Station development. It seems our green will not be affected, and furthermore the main entrance to the site will be at the far Meaford end of the site, so it seems the impact on us will be as minimal as we could have hoped. Time will tell! The final Oakhill table shows that our team have been our most successful this season, finishing in an excellent 7th position out of 14. Winning four out of their 13 away games certainly contributed to this high placing, so well done to all involved with the Oakhill team. The final table for the Saturday Mixed League has been published, showing our team finishing in 9th place out of 12. Once again solid home form (8 wins out of 11), was compromised by only one win away from home. Nevertheless it was a good season with the team always mid-table and well clear of the bottom 3 teams. 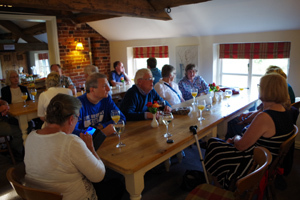 Wednesday 9th October from 1pm to 7pm at Lakeside Tavern. Thursday 10th October from 1pm to 8pm at Station Community Centre, Stone Rail Station. 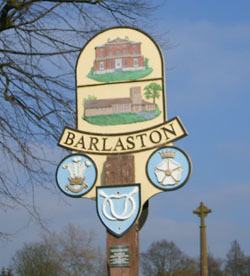 Friday 11th October from 1pm to 7pm at Barlaston Village Hall. It would seem worhtwhile to attend one of these events if you can. 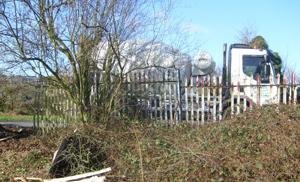 "Plans have been drawn up for a gas-fired power station in Staffordshire, a developer has confirmed. It would be built on the site of a former coal-fired station at Meaford Business Park. The proposals, which are yet to be finalised, will require the approval of the secretary of state for energy and climate change. 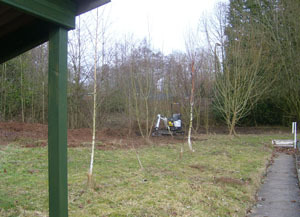 Meaford Energy Ltd, which is a branch of property developer St Modwen, said the plans were at a very early stage. The company estimated 800 construction jobs would be created, with a further 30 to staff the plant once it is operational. The plans include a new connection to the national gas and electricity distribution networks. 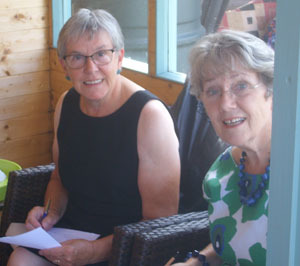 Meaford Energy said: "We are currently developing outline plans and, at the appropriate time, we will begin an initial, informal consultation with the community and key stakeholders." The plant works by igniting compressed air and gas which are fed into a combustion turbine, which in turn drives a generator. The surplus heat from the generator is used to create steam, which is used to drive a second turbine attached to another generator. "This turns what could be waste heat into an efficient source of additional power," the company said. 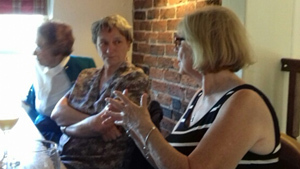 A date for the informal consultation has not yet been set. 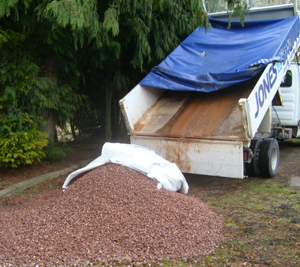 Meaford Energy said it would be a number of years before any work could begin on site". 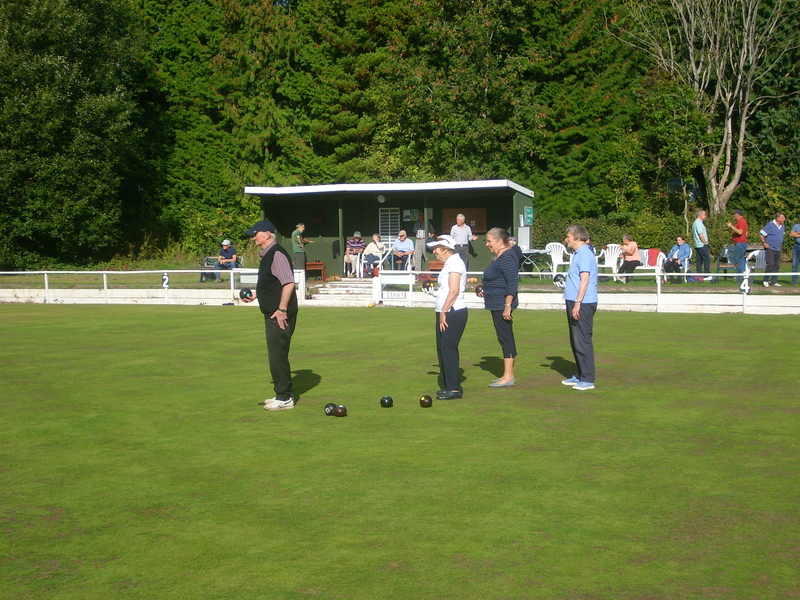 Monday 9th September saw a friendly match take place against Little Stoke on our green. 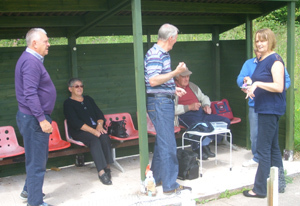 Despite the appearence of a couple of heavy showers, a good time was had by all, in a match that saw a narrow 5 point victory for the home team. It is hoped a return match may be arranged before the end of the season. The final table for the ladies league shows that our team has finished in a solid 6th position. Even during a difficult start to the season, the team always scored well, and this, coupled with a strong finish to the season, has seen them achieve a comfortable mid-table position. Well done ladies! 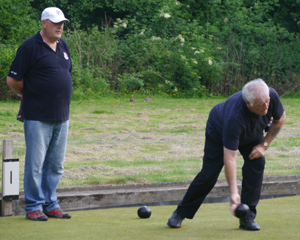 The final table for the Stoke Men's League has been published, with our boys finishing in 8th place. A creditable performance at home, winning 6 and only losing 3 of the games, but unfortunately losing every game away from home has cost the team dear. Oh well, there's always next season! Unfortunately not such good news this time from our two star youngsters in the Drake's Pride Junior County Championships. Emma lost 21-12 and Kyle was beaten 21-8 as Potteries & District lost out to Warwick & Worcester, who now go on to play Yorkshire in the final. 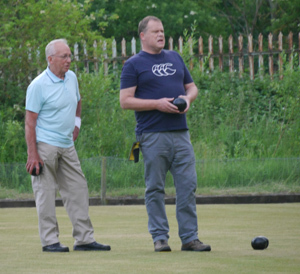 The next big occasion for these two is the British Parks Crown Green Bowling Association Junior Merit Competition which takes place on Sunday 22nd September at Florence Tennis & Bowling Club, Cemetary Road. Once again we hope they have benefitted from their experience on Sunday and bring their 'A' game to the Junior Merit Competition. Good luck to both! As mentioned below, this Sunday, 11th August sees Emma and Kyle representing Potteries & District against Warwick & Worcester in the semi-finals of the Drakes Pride Junior County Championship. The match takes place at Wolstanton WMC, and Emma will be in match 3 against Natalie Bubb, whilst Kyle is in match 8 against Bradley Williams. If you're free why not go along and give them your support - we wish them both the best of luck! Hopefully the change in appearance of the website is making it easier for you to find your way around. You may also notice a new page (on the far right of the screen) showing the addresses of local clubs, which those of you on email will already have seen, but being here should make it easier to find. 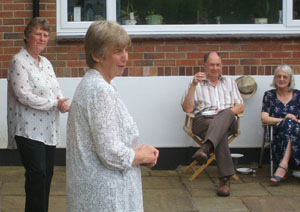 A big thank you to Carole and her family for hosting the Garden Party. 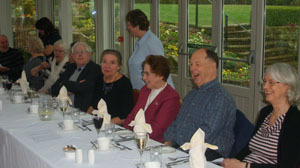 Unfortunately the weather chose to have the only iffy day for the last two weeks, but still a good time was had by all. All 'the votes have yet to be counted', but current indications are that proceeds will approach £300, so thank you for your generosity. 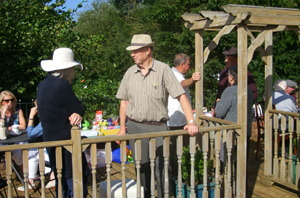 DON'T FORGET - this coming Sunday (21st) sees Carole's 'annual' garden party. Full details below in red - be there or be square! Kyle and Emma continue to do us proud. 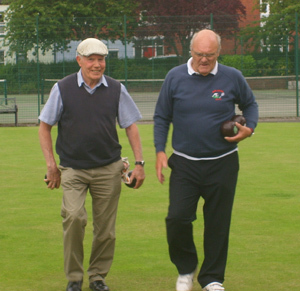 On Sunday 14th July they both represented Potteries & District in a section four match against Merseyside in the Drake's Pride Junior County Championships at Florence T&BC. Kyle won his match 21-18 and Emma won 21-16 thus helping their team through to the semi-finals. Well done both! 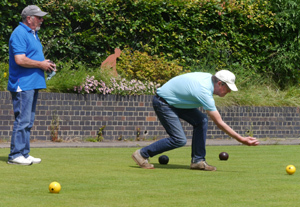 In the semi's, which take place on Sunday 11th August, Potteries & District have been drawn against Warwick & Worcester. More good news from our 'next generation'. 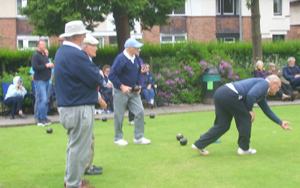 On 30th June Kyle represented the county in the Parks Inter-county championships at Birkenhead, but unfortunately Staffs failed to reach the final. 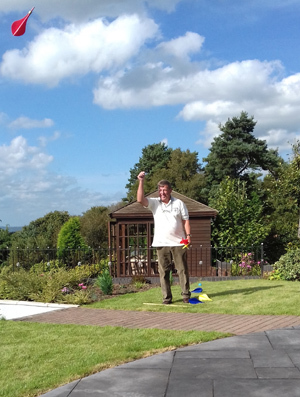 On 7th July Kyle and Emma took part in the Knypersley Junion Open competition. Emma reached the quarter final, and Kyle made it all the way to the final, where, after a poor start he fought a long way back, before finally losing 21-16. A great and encouraging effort from these two fine young players. With most teams currently experiencing a break in fixtures, it seems a good moment to review the season so far. The comments are based on the latest information I have available, and are purely those of the author and not representative of the Club. 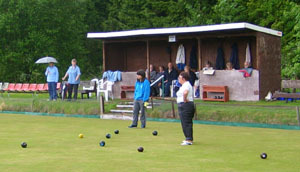 Starting with the ladies, they are currently revelling in 3rd place in the league. Admitedly this is a slightly false position as teams just behind have games in hand, but nevertheless is a tribute to the fact that even in defeat the team have been scoring highly and this is now standing them in good stead. In the Stoke mens league the team are currently 6th out of ten, representing a good solid mid-table position. Unfortunately the team have been unable to win away, but this has been counter-balanced by good home form. 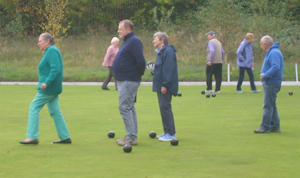 Similarly, the Saturday Mixed team are currently 6th out of 12, with a 100% record at home, and some solid points scoring away, with the notable exception of the 'impossible' Goldenhill green! 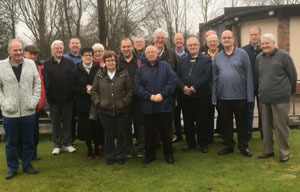 The Oakhill team are 8th out of 14, and to their credit have managed to pick up two away wins, which has helped them to the current healthy position. On the individual front, it has been great for the club to see Kyle and Emma receive junior county recognition, and hopefully this bodes well for the long-term future of the club. 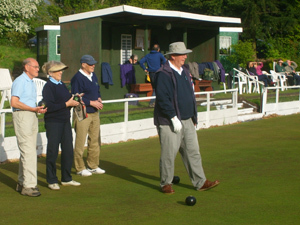 So, in general all our teams are performing solidly, and, most importantly, are enjoying their bowls. It has been noticeable on a couple of occasions that members of opposition teams have fallen out with each other, and whilst we all like to win, it shouldn't be at the expense of having a good time. 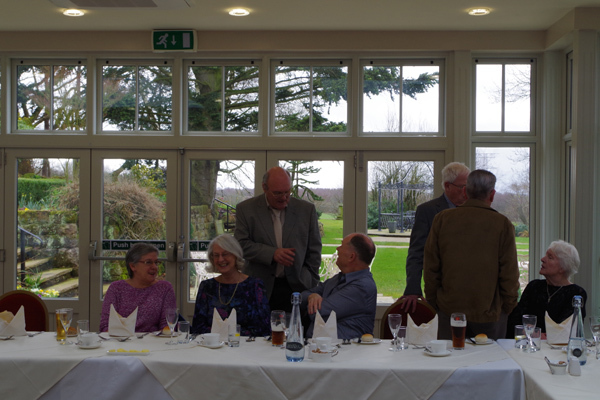 Off the green, the social side of the club continues to prosper, with the annual club lunch, Friday social bowling, and Carole's garden party all being well supported. 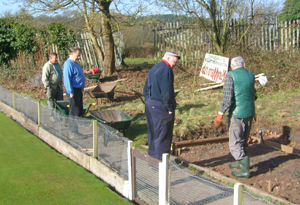 A small group of volunteers have also been working on the green and surrounds to good effect, thus adding to the experience for home players and opposition alike. 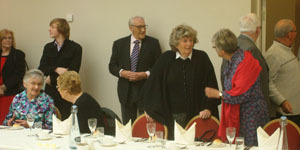 As is customary, it would be remiss not to express thanks to all those who help the club and teams to run so sucessfully. In conclusion, enjoy the second half of the season, which hopefully will be played in somewhat warmer conditions! The friendly match against Stone Crown resulted in a win for the home team by 192 points to 153. 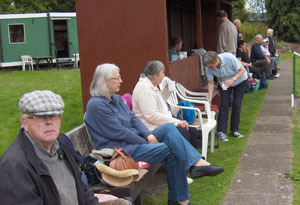 An unusual format of multiple doubles matches played up to 15 points enabled players to partake in up to 3 games each and thus gain plenty of match time. 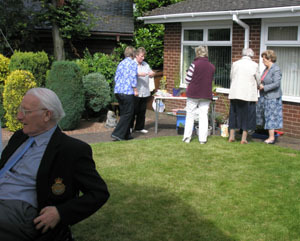 Many thanks again to those who provided and served the refreshments , and to Gareth for his organisation. 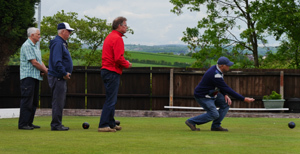 Just a reminder that this Friday (21st June), the usual social bowling will be replaced by a friendly match against Stone Crown, starting at 2pm. 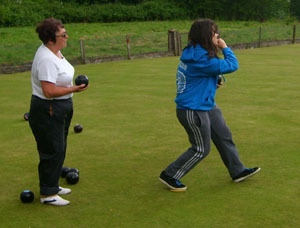 Those who have missed their social bowling 'fix' will be pleased to hear it will return on 28th June. Following in the footsteps of Kyle Marshall, many congratulations to Emma Dawson who has been called up to play for the County at Junior level. Royal Ascot, Lords Test Match, Henley Regatta, Wimbledon - all part of the english "season". 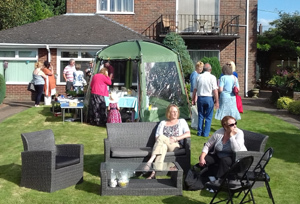 The latest addition to that list is of course Carole's Garden Party, which this year will take place at 2pm on Sunday 21st July. 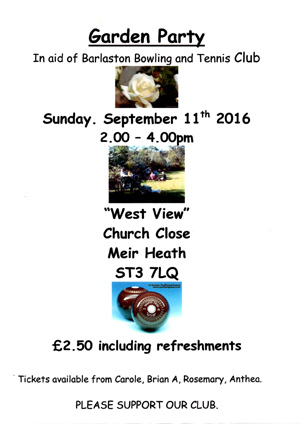 As before,there will be refreshments, home produce, plants, tombola, raffle, cakes and the proceeds will go to the bowling club. Tickets will be available nearer the time (priced at a bargain £2.50), and it will all take place at West View, Church Close, Meir Heath ST3 7LQ. 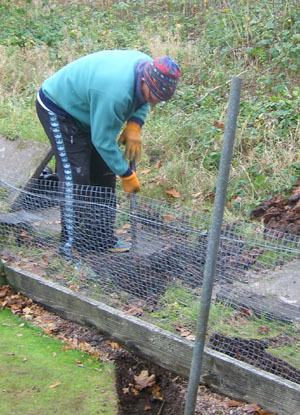 You hopefully will have noticed the improvement to the Green surrounds in recent weeks, This work is being undertaken by a small but dedicated group of volunteers on Monday afternoons at 2.00. 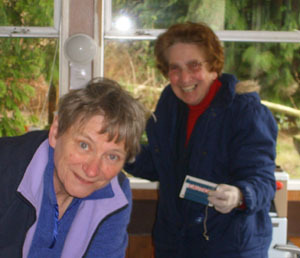 Extra pairs of hands are always welcome. 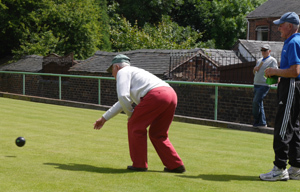 On Friday 14th June the usual social bowling will be replaced by a friendly match against U3A. Anyone wishing to take part should contact Gareth Jones. 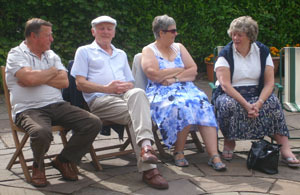 Another date for your diary: It is the intention to repeat the success of last year's Garden Party at Carol Duffy's. 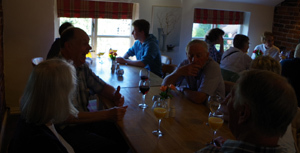 The proposed date is 21st July, and keep checking here for further details. 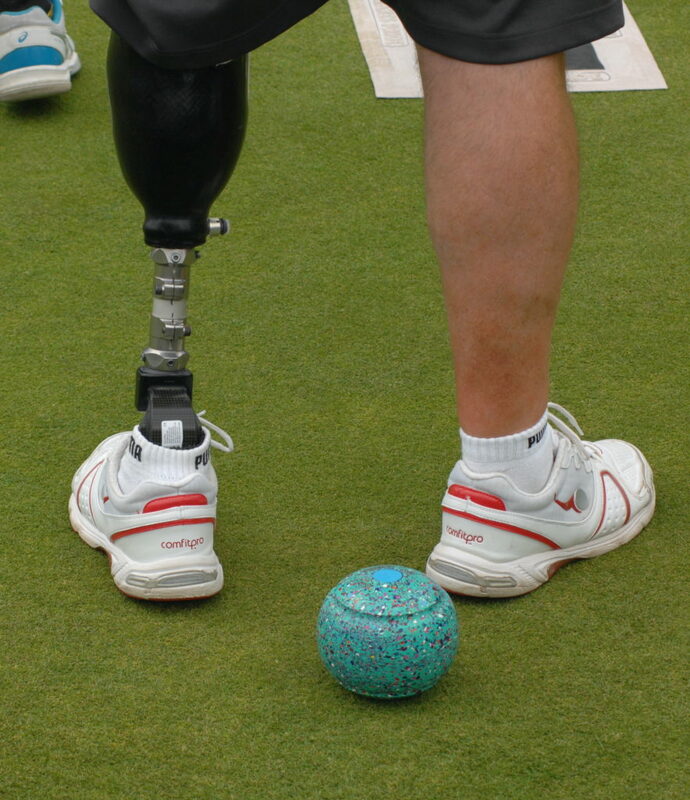 The 2013 fixtures and tables for all the Leagues in which we participate are now available. 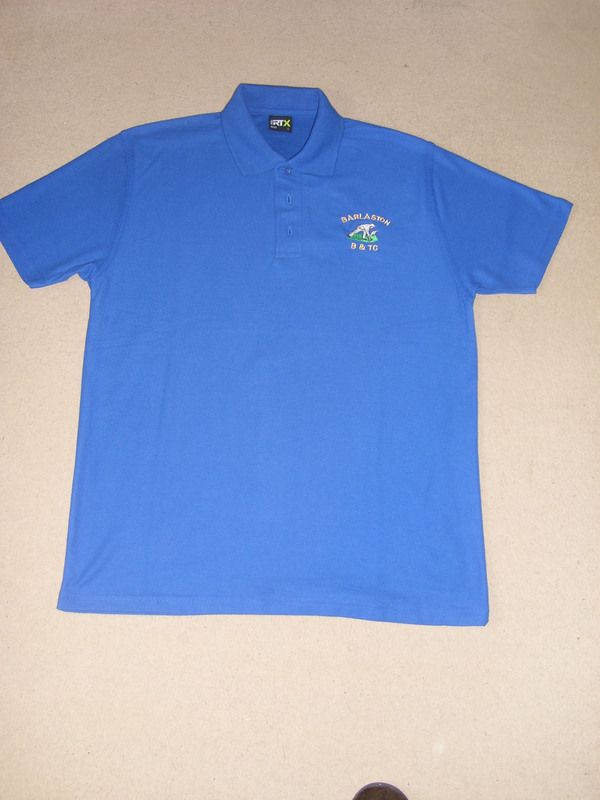 Sorry for the delay and many thanks to Steve Hall for his valuable assistance in creating these. 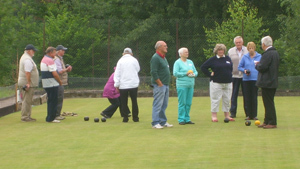 Anyone who is interested in having a game of bowls, please come along on any Friday. 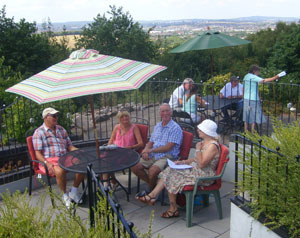 Members free, non members £1.00 per afternoon. 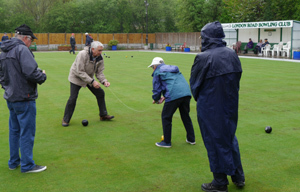 The sessions don’t take place if it is raining! 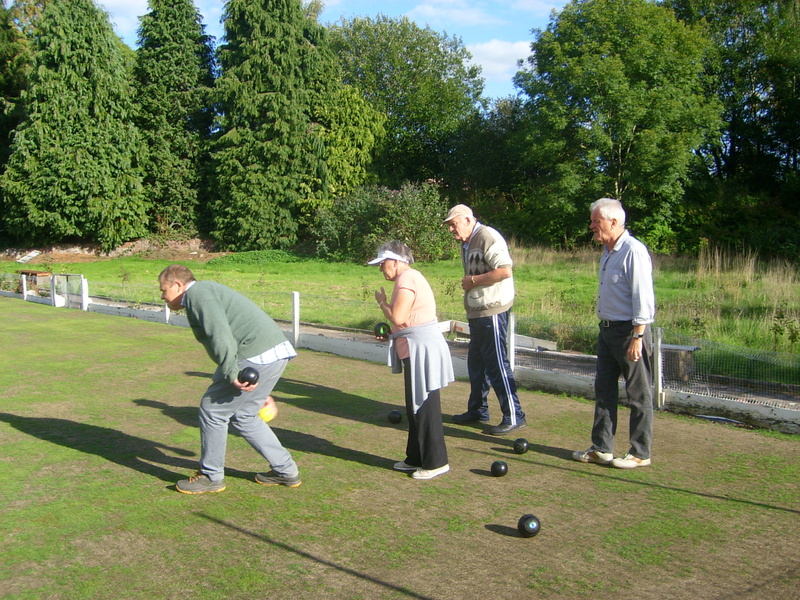 If you want to learn to play there are people to help and we have spare bowls if you need them. 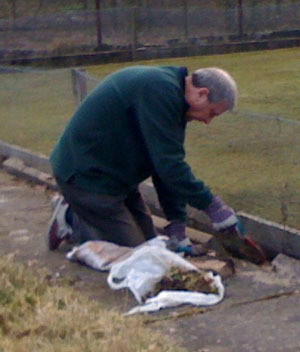 Saturday March 23rd - Club Clear up day 10.00 to 12.00. All welcome! 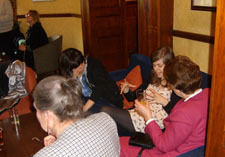 From all accounts a good time was had by all. 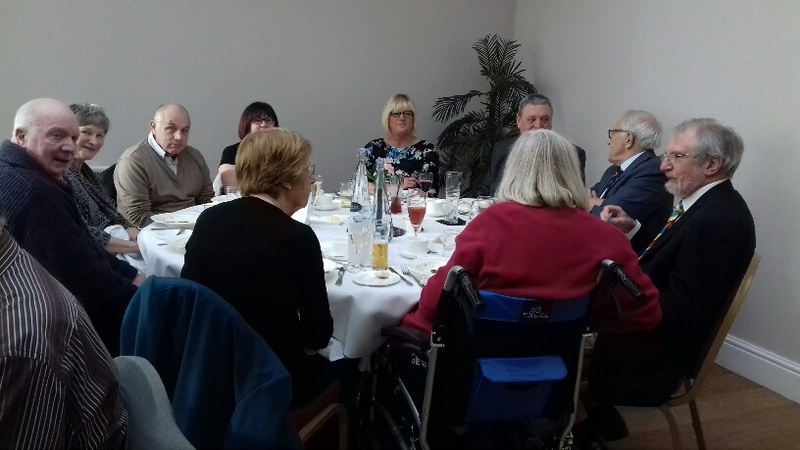 Thanks to Anne Boswell for organising it, who unfortunately was unable to attend, and I'm sure everyone at the club joins me in wishing her a speedy recovery. 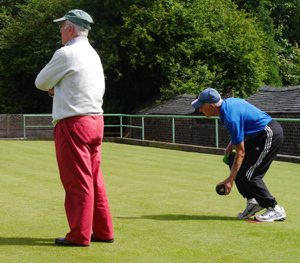 Happy New Year and may all your bowls be good ones! 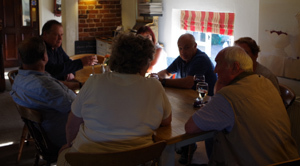 The Club AGM takes place this Tuesday (20th) at the Village Hall at 7pm. Best wishes for a speedy recovery from everyone at the Club to Renee after her recent fall. 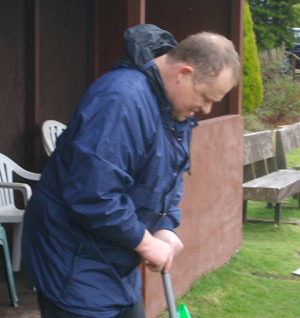 Steve's funeral will take place on Wednesday 24th October at 12.00 at the Crematorium in Leek Road. Our team in the Oakhill league have finished in a very good 8th place out of 14. Winning the last three games of the season represented a strong finish which hopefully can be carried forward into the new season next year. The final Saturday Mixed League table is now available and reveals that we have finished comfortably mid-table in 7th place. As with the other leagues it is the away form that let us down but nevertheless a good solid season which I believe was enjoyed by all. 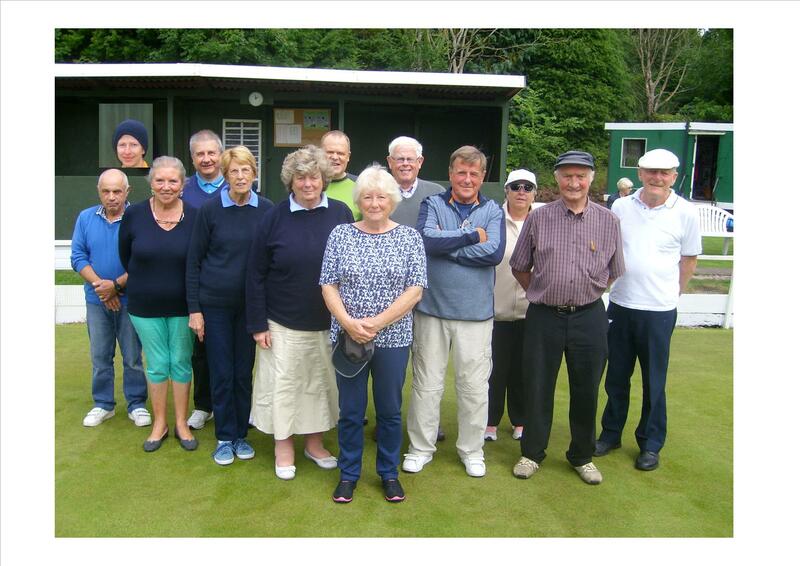 The final of the Mixed Triples competition is taking place on our Green on Saturday 6th October at 2pm. If it's a nice day why not pop along and take in the action. The Club is deeply saddened to hear the news that Steve passed away in the tragic aircrash which occurred in Nepal today (28th September). 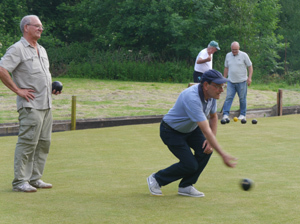 Steve was a very popular member of the Club who regularly participated in social bowling on a Friday afternoon. On behalf of the Club we extend our sympathies to his family and friends. Rest in peace. 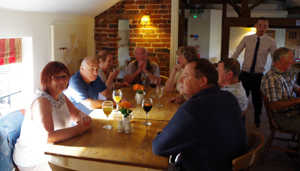 NB The Club AGM will take place in the Village Hall at 7pm on Tuesday 20th November. Completion of the Staffs Ladies League fixtures see our team unfortunately unable to lift themselves from 10th place, despite a marked improvement in results in the final few weeks. Hopefully they will be one of the favourites to win Division Five next season. The Stoke League fixtures have been completed and our team have finished in a very creditable 5th place out of 9. Frustratingly the team were only 3 points off finishing 4th, but nevertheless this represents a very solid season - well done to all. 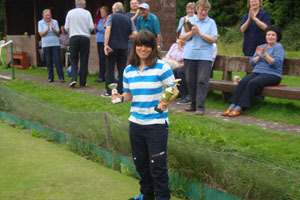 Many congratulations to Emma Dawson, who on Friday 24th August won not one, but two trophies for winning the North Staffs Junior Bowls League Under 15 Championship for 2012. 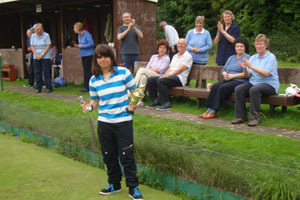 Here she is proudly showing off her trophies, whilst receiving deserved applause from fellow club members. 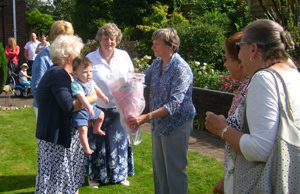 Also congratulations to Pam Bedford, tireless secretary of our Club who has very deservedly been nominated to receive a Certificate of Commendation for her contribution to Barlaston village life. 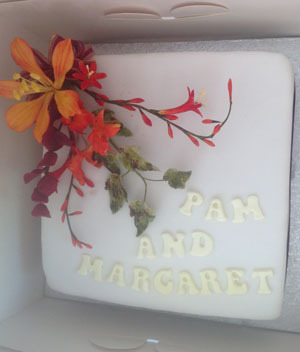 Well done Pam! 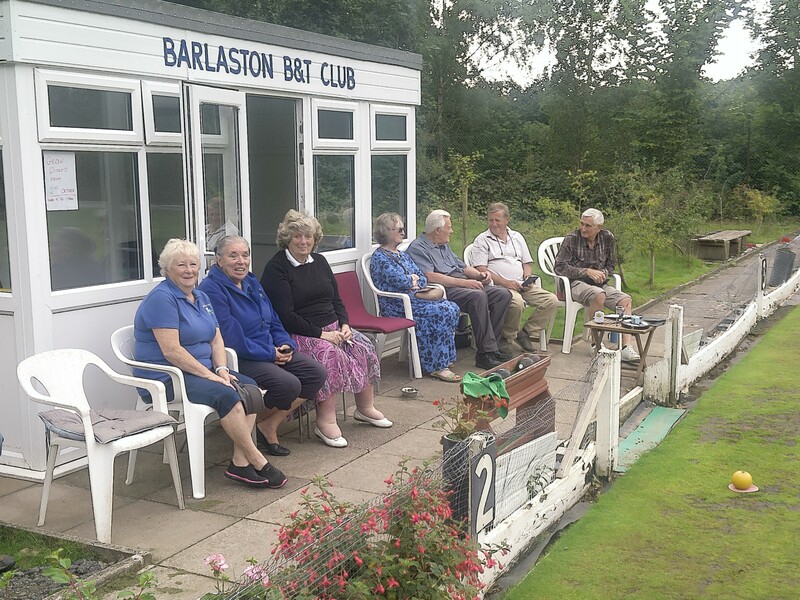 The U3A bowlers entered into the world of competitive action on Friday, August 24th, when following the suggestion of Chairman, Gareth Jones, a friendly match took place at Barlaston BC. 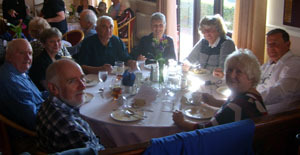 Six very close doubles took place----U3A victorious by 5-1-----interrupted only by tea and excellent cakes. 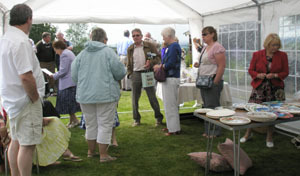 A good time was had by all (despite some late drizzle) and hopefully the event will be repeated in the future. 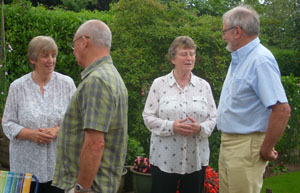 Carole Duffy kindly volunteered to host an Open Garden/Social Afternoon with all proceeds going to the Club. 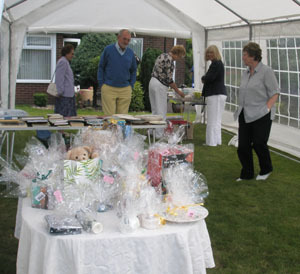 This event took place on Sunday 29th July at 2pm and featured Home Produce, plants, raffle, tombola and cakes. 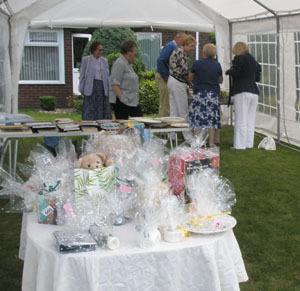 Despite a couple of showers, the event went very well and raised a significant sum for the club. 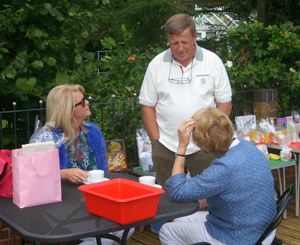 Many thanks to Carole for her excellent hospitality, and thanks to all who volunteered to help in various ways. Being roughly halfway through the season, I thought it would be a good opportunity to review the season so far. The comments are based on the latest information I have available, and are purely those of the author and not representative of the Club. Being a gentleman, I will start with the ladies. They are clearly the strongest team in their division, as they are holding the rest up! They've scored consistently but have yet to secure that first win, but I'm sure it's just around the corner. 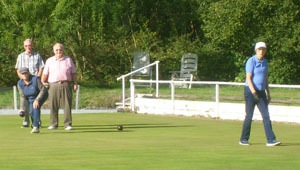 The Oakhill team are currently 9th out of 14 and are undefeated at home. So far they've only managed one win away, so perhaps that's where they can look to improve in the second half. 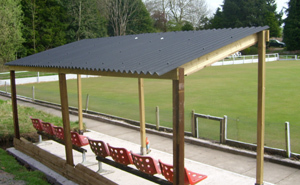 The Stoke team are 6th out of 9, and have yet to win away, and so, like the Oakhill team, this is where they could look to improve. The Saturday Mixed team are currently 6th out of 11, having been beaten only once at home, but unfortunately the win in their first away game of the season has not been repeated, so again the away form holds the key to a better position. 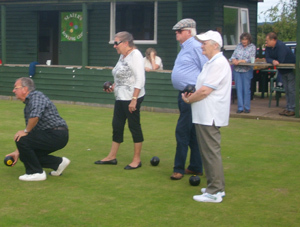 Friday social bowls has undoubtedly been affected by this wonderful summer (! 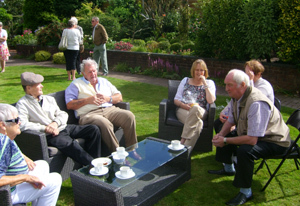 ), but hopefully the regular diehards will be joined by others when (if) the weather improves. Finally thanks are due to all those who voluntarily give their time and effort to keep the Club and teams running so well. 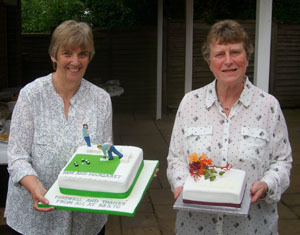 Congratulations to Pam Bedford and Margaret Catlow who have both qualified as Class 1 Coaches with the BCGBA. 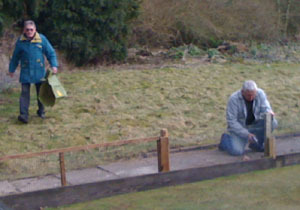 A group of willing volunteers gave the Green, its surrounds, and the clubhouse its annual spring clean in preparation for the new 2012 season. 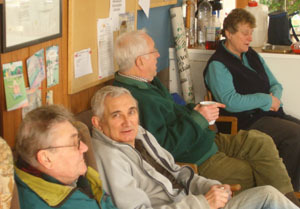 The group takes a well-earned rest!